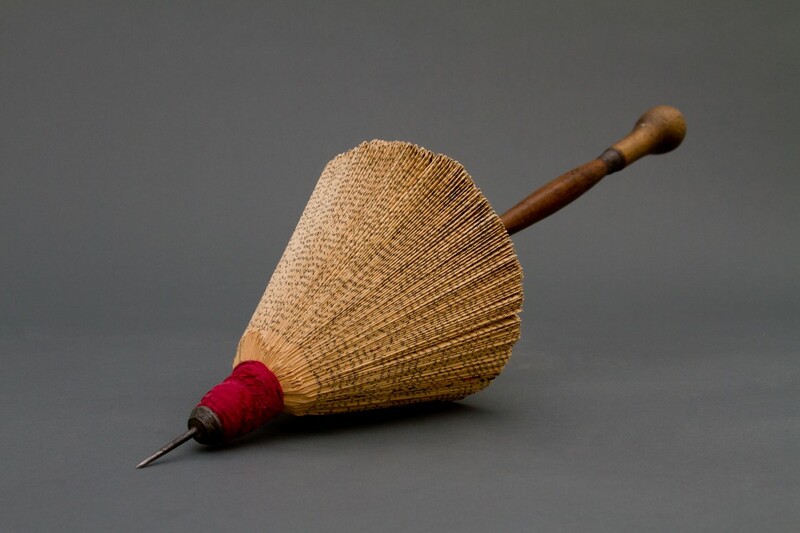 This exhibition celebrates the Center’s 17th year of hosting the International Turning Exchange (ITE) Residency program in partnership with the University of the Arts (UArts). The Windgate ITE residents convene here and work, travel and research for 2 months to personally and collectively develop new directions for their work. 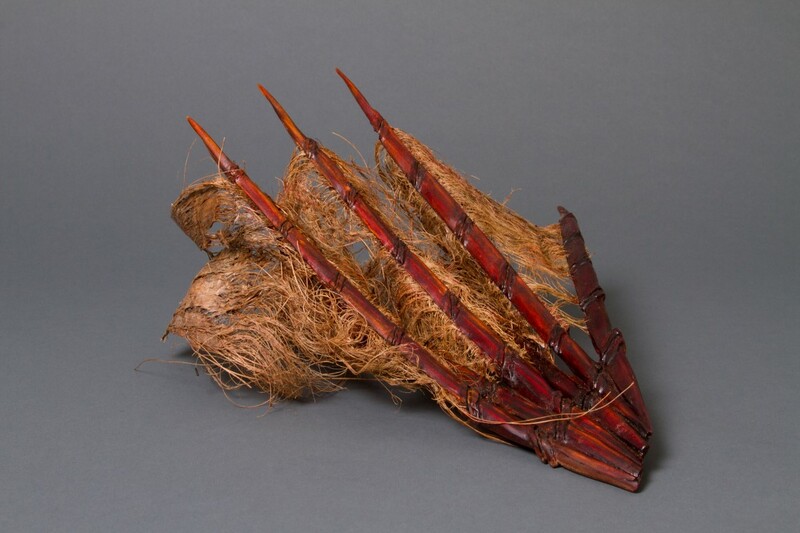 The allTURNatives exhibit is multi-disciplinary and reflects each resident’s experience through objects and materials produced before and during the residency. Three-dimensional works are accompanied by photos, essays and other documentation depicting their singular and joint summer away from home. In this age of mass production and reproduction, when print culture is thought to be vanishing, I seek to work with books in an individual and personal way. As a child, growing up in rural Greece, I did not have books of my own. Today, books collected from pavement curbs as they wait to be picked up by the recycling truck become my raw materials. 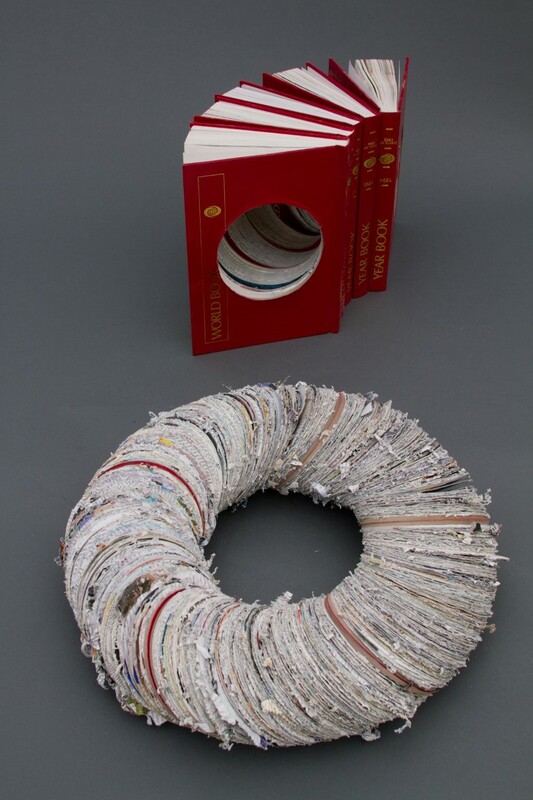 I cut and fold pages of books in order to create more complex environments that explore the connections between the natural and the human made, and between the personal and the collective. 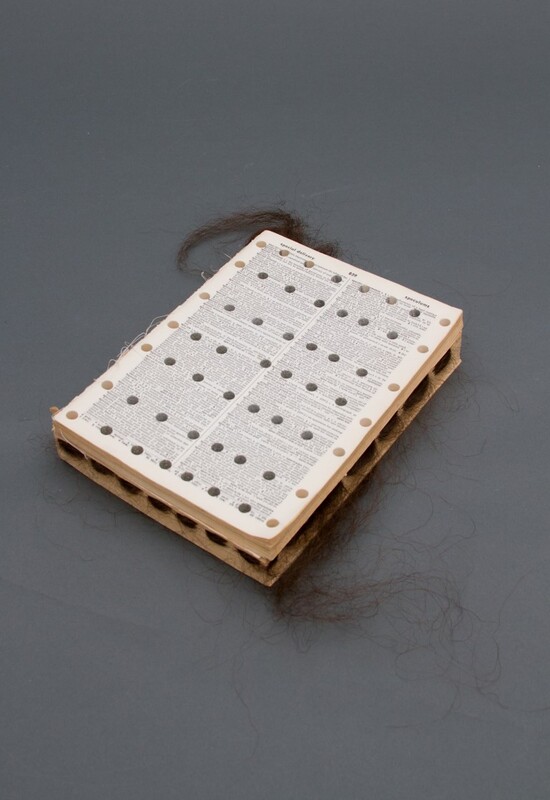 In my book installations I want the viewer to feel the ephemeral nature of paper and the actual vulnerability of the material itself. I like to dissect the physical or conceptual content of the books, altering their structure and meaning into a new personal narrative. 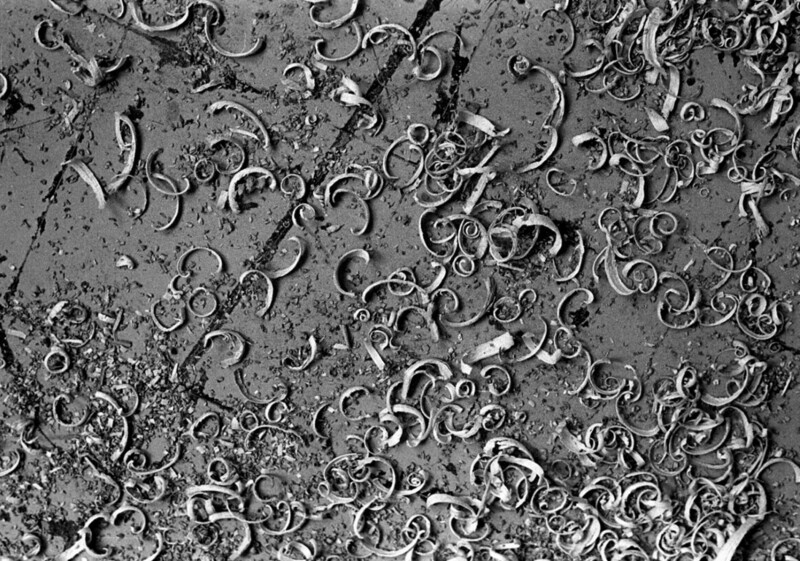 Through the combined processes of dissection and alteration of materials I develop my own visual lexicon, which leads to transformation based on personal memory and experience. I perceive books as having lives and bodies, as containers of memory. Folding, cutting and manipulating books has become my meditative process as I try to touch the past, a body to body experience, that allows me to enter their world. In this residency I was able to appreciate wood in a way that connected me with the single tree rather than the whole forest. 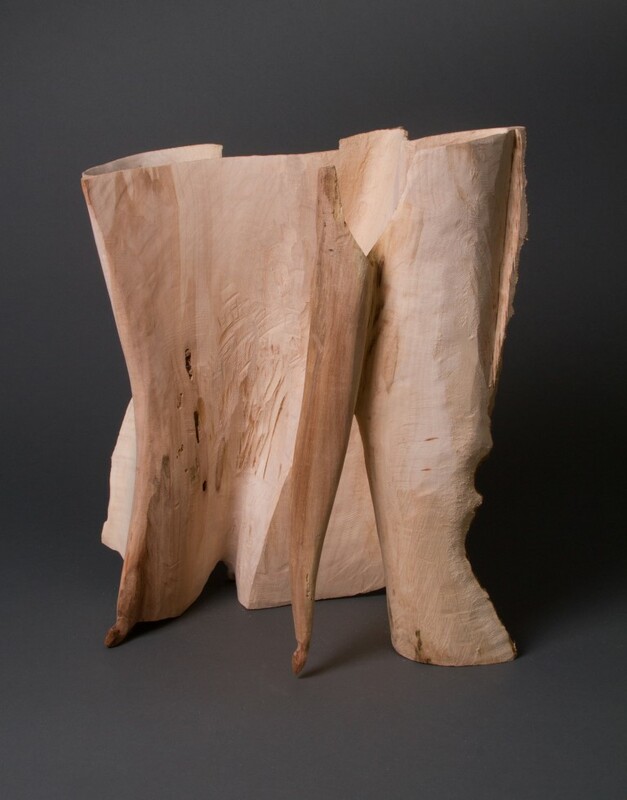 My new relationship with wood allows me to use paper and wood as an extension of each other in an attempt to connect the two forms that came from the same source, the body of the tree. I grew up in a house with a well-outfitted wood shop, and I have a healthy (if over-cautious) fear of power tools. When I was invited to join the ITE program I was intrigued and a little scared. 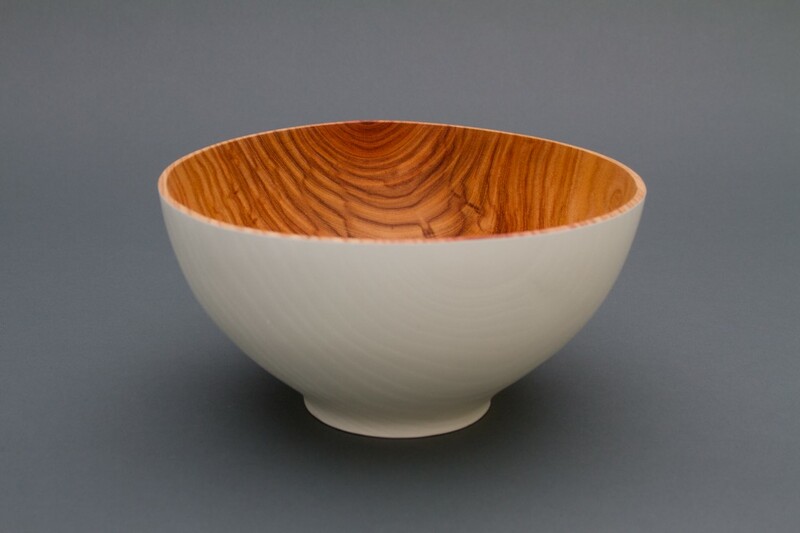 Over the years, stories of family members running afoul of routers made me content to avoid furniture making in favor of working with porcelain, yarn or a camera when I needed a hands-on experience. Since moving to Philadelphia last summer, I have worked in an historic building, the Philadelphia Art Alliance, that features extraordinary original woodwork from the turn of the 20th century. 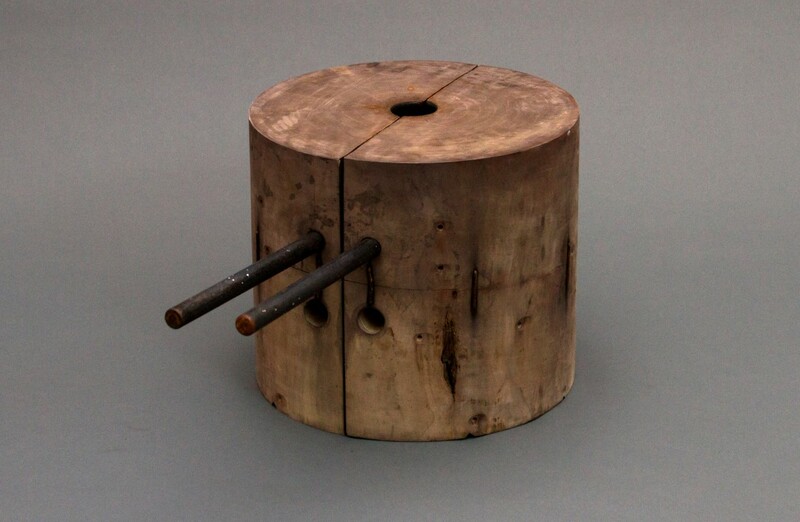 That, along with now living in a city with a furniture tradition revered by decorative arts specialists the world over, made the time seem right to stare down a whirring lathe. On my first day visiting the ITE residency studios at the University of the Arts, I found a comrade in artist Maria Anasazi who I considered to be the other “non-wood” person in the group. She was new to the machines and seemed acutely aware, as I was, of their awesome power. The group was artistically and geographically diverse. 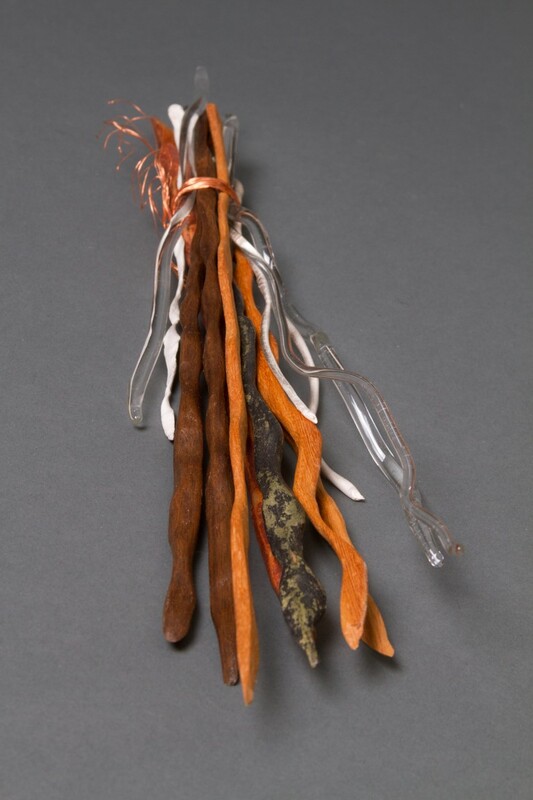 Maria, a native of Athens, Greece, is based in Philadelphia and works with found objects, books and human hair among other materials. 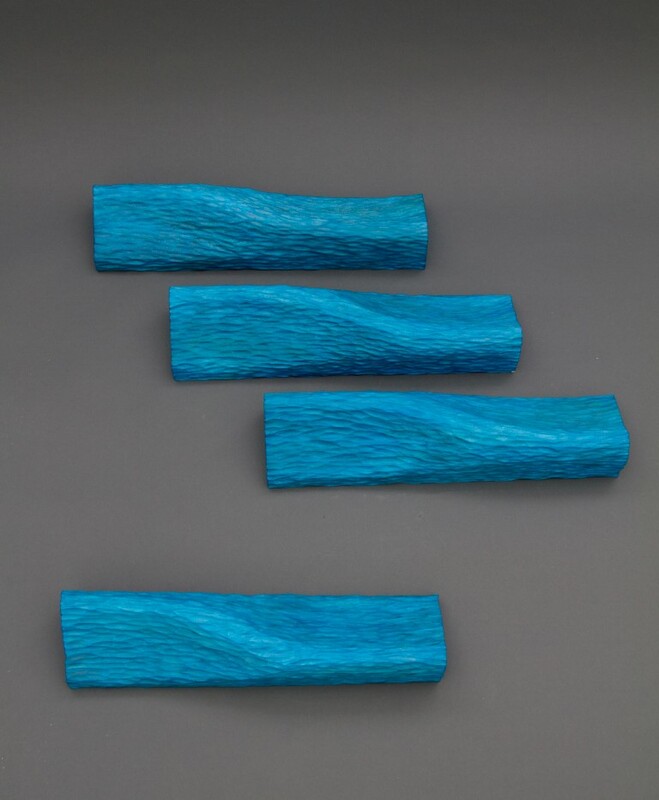 Darrell Copeland lives in North Carolina and works primarily with wood, making wall pieces and small objects, investigating color and form. Michael Koehler is a Philadelphia-based photographer who has traveled extensively had has a keen interest in analog (non-digital) photographic processes. 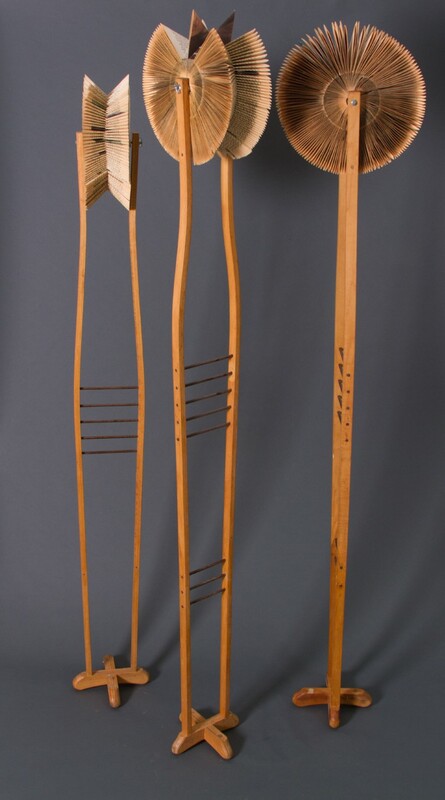 Daniel Ostrov is a Wisconsin native who moved to Philadelphia to study glass at Tyler, and has subsequently began designing furniture and objects using steam-bent wood. 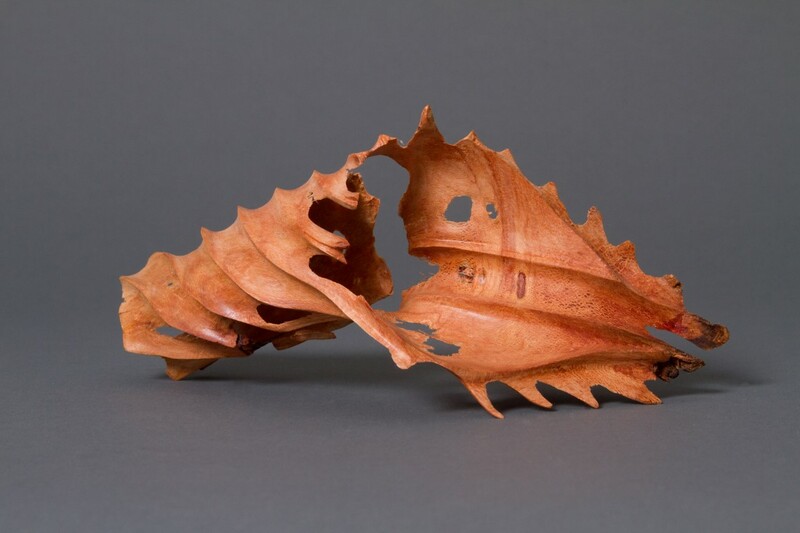 Jeannette Rein from Perth in Western Australia works with indigenous woods in a largely sculptural practice. 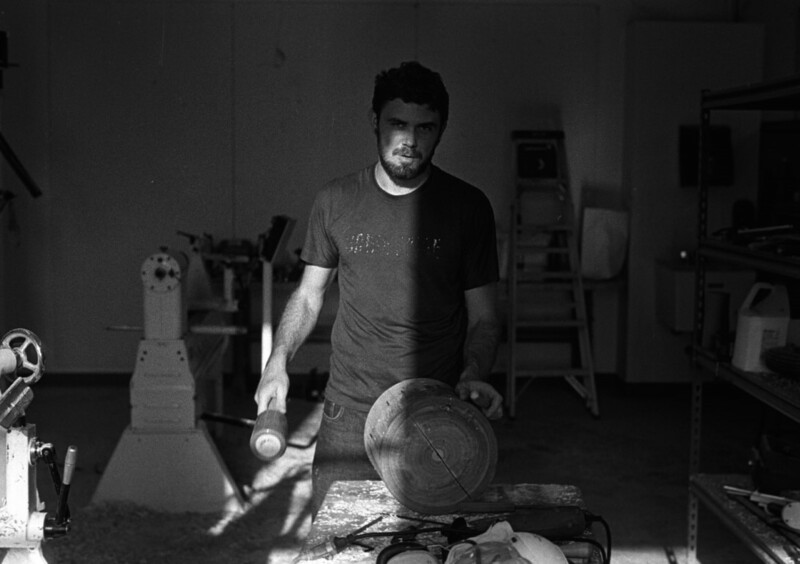 John Hallett who lives in Adelaide studied industrial design and works as a fabricator, often collaborating with furniture designers, and spent a year studying glassblowing and mold-making in Italy and the Czech Republic. All this variety lent the studios an experimental feeling. No two Residents were alike in their interests, aesthetic or background. This gave me pause to consider the ways in which wood has real cultural and geographic specificity. 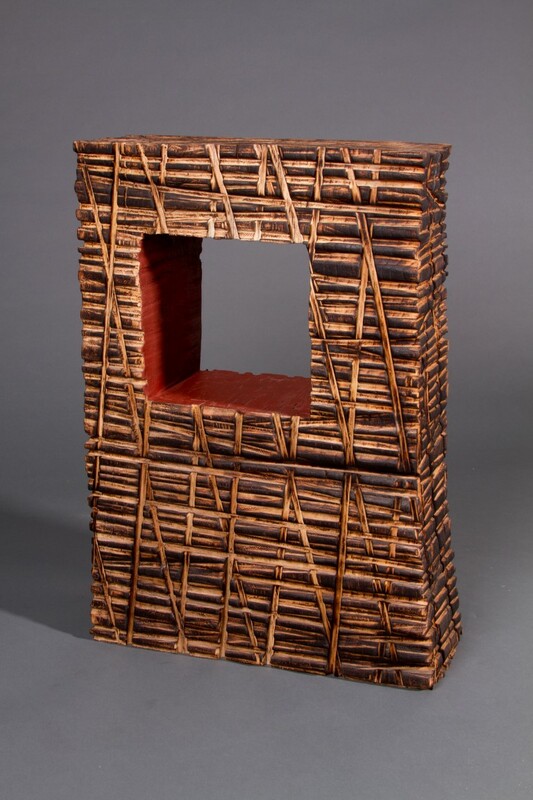 Artist Jeannette Rein remarked early on that wood is akin to a three-dimensional fiber or cloth: it has a grain that runs in a particular direction, it is organic and responds to heat and dye, and it can be bent, cut or formed to a desired shape. 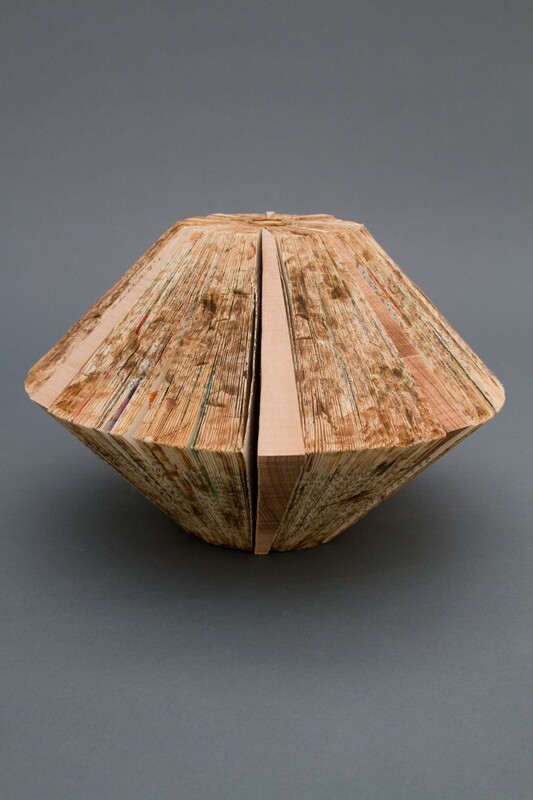 With this in mind I was intrigued to find Maria Anasazi working with vintage books, since paper is derived from wood and in their solid form, books could be considered solid blocks of wood byproduct. 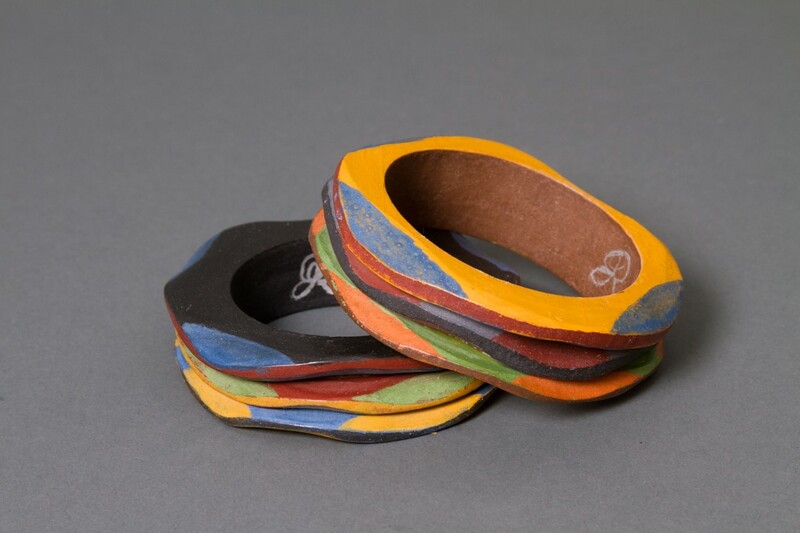 Like wood, paper is pliable and vulnerable, yet substantive and solid. 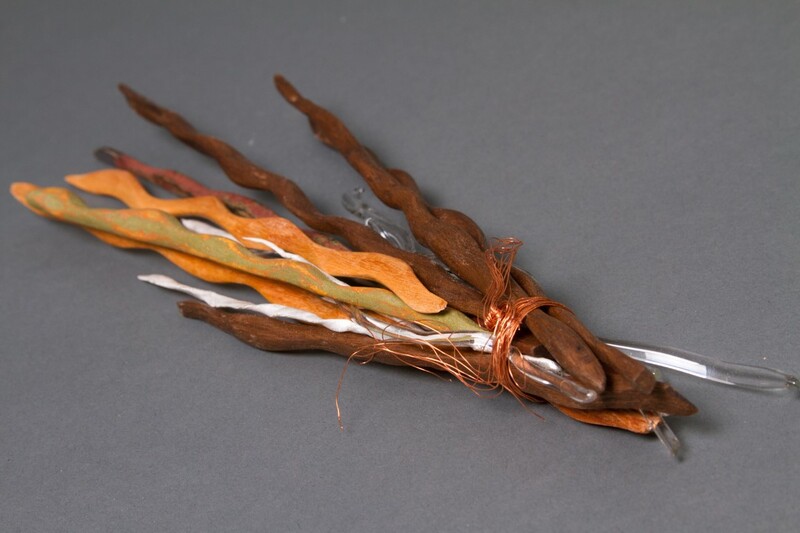 Anasazi’s work, though not traditionally woodwork in the same way as that of the other Residents, has a resonance with wood because it relies on history and memory. 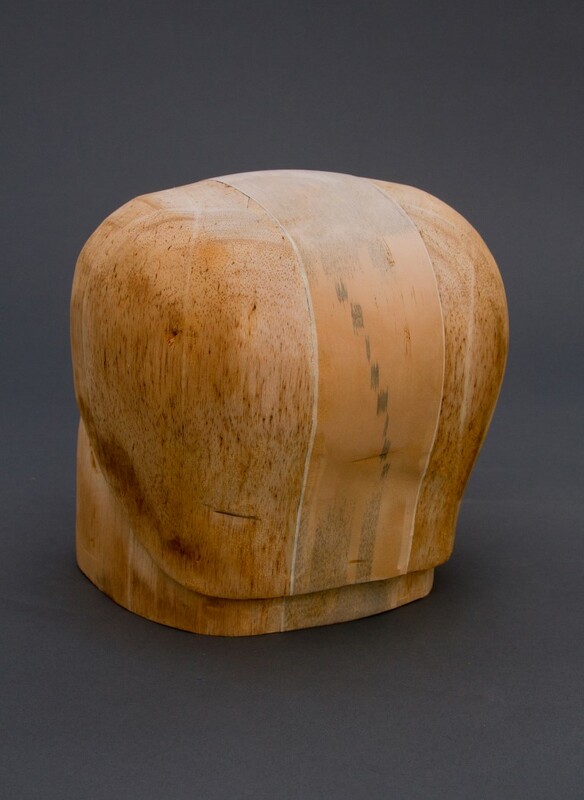 Wood tells a physical and chemical story in much the same way that stone does, recording events and changes in its environment. Centuries of environmental information are stored in its layers. The analogy to a vintage book, then, is not so far fetched. 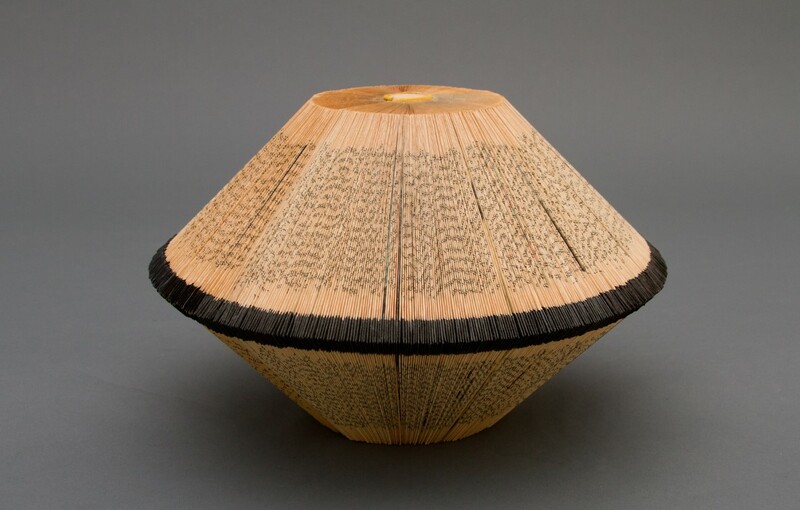 Maria worked with found objects including a hat mold with an abstract, almost Brancusi-like shape, splitting it down the center and reconstituting it with the pages of a dictionary in the center. Exploring this connection allowed Maria to investigate a topic she was already working with – memory and the accumulation of knowledge – while also experimenting with some new practical knowledge herself. 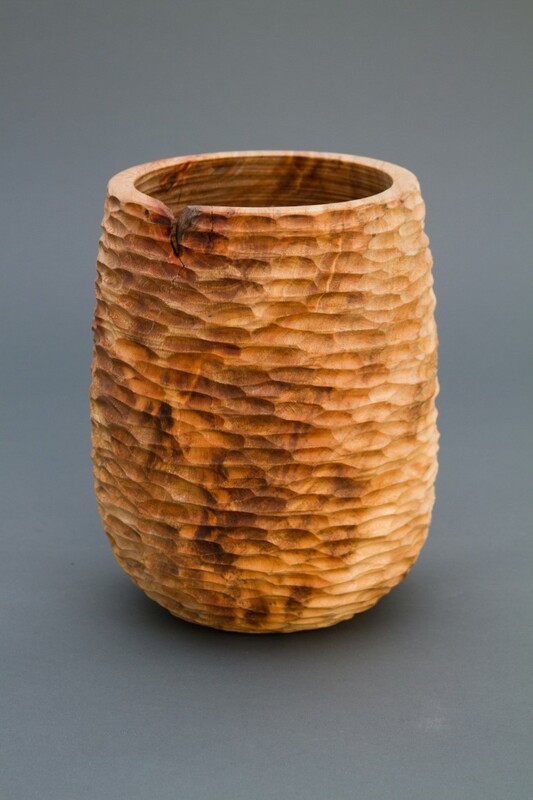 That an artist relatively untrained in wood techniques was able to glean so much from the ITE experience is a testament to its inclusive and inspiring curriculum. 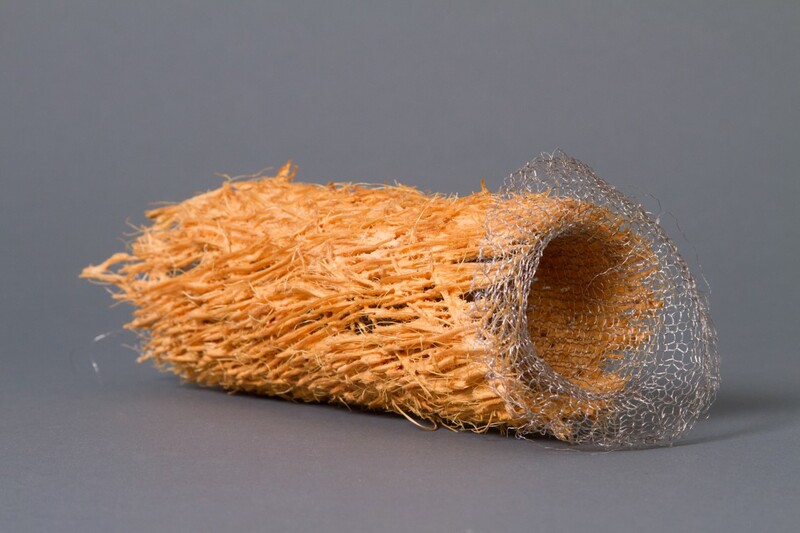 History and memory loom large Jeannette Rein’s work as well. 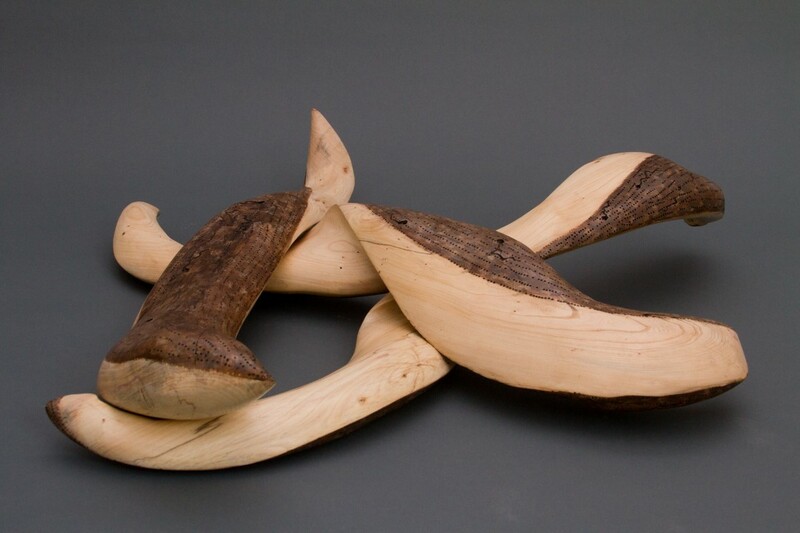 More than any other Resident, Rein tends to leave pieces of wood relatively close to their original form. 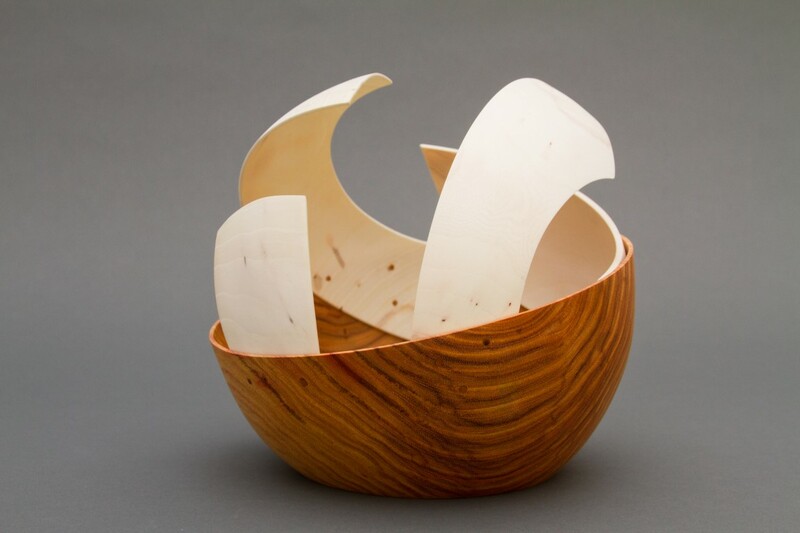 She selects pieces with compelling shapes and works them, sanding and cutting, adding milk paint as a colorant or bleaching the wood to make it translucent, but by and large the wood retains much of its original architecture after she’s finished. 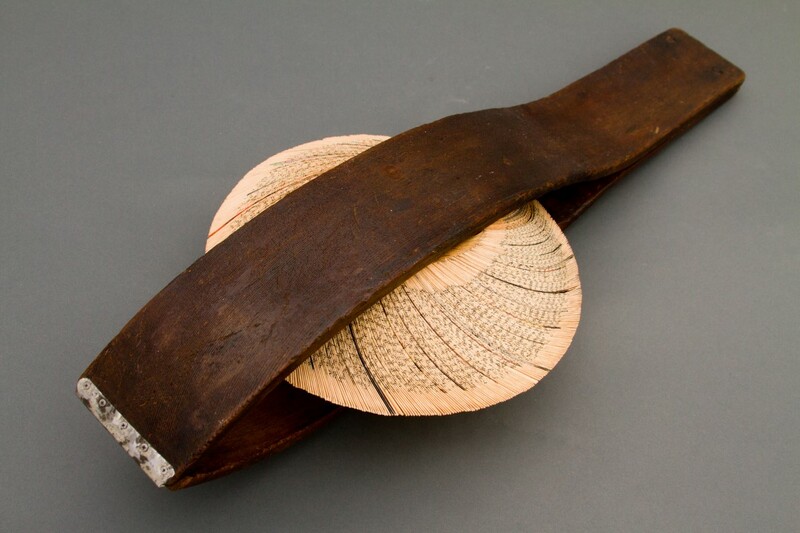 Three substantive pieces of bass wood, notably serpent-shaped, are decorated with small holes and reflect an affinity with Aboriginal map designs. 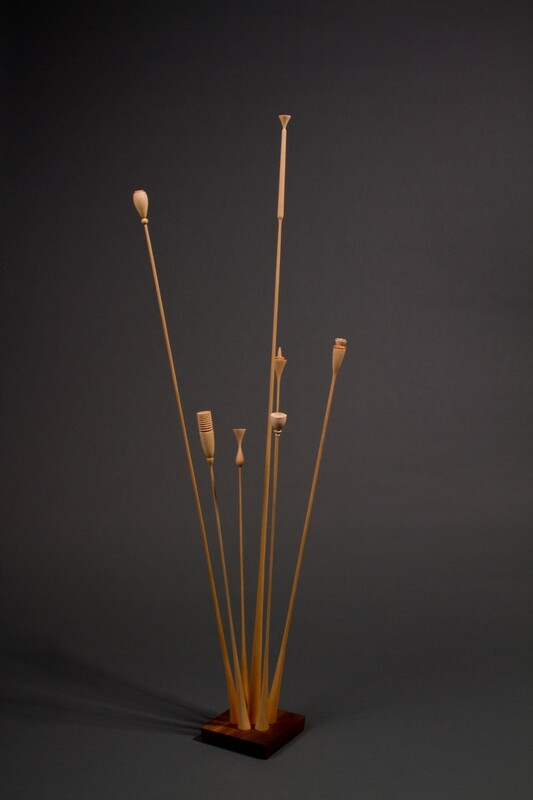 That the pieces can be rearranged and installed in various ways (they are not attached to one another) is a playful comment on the relative nature of our methods for imposing order on the natural world. 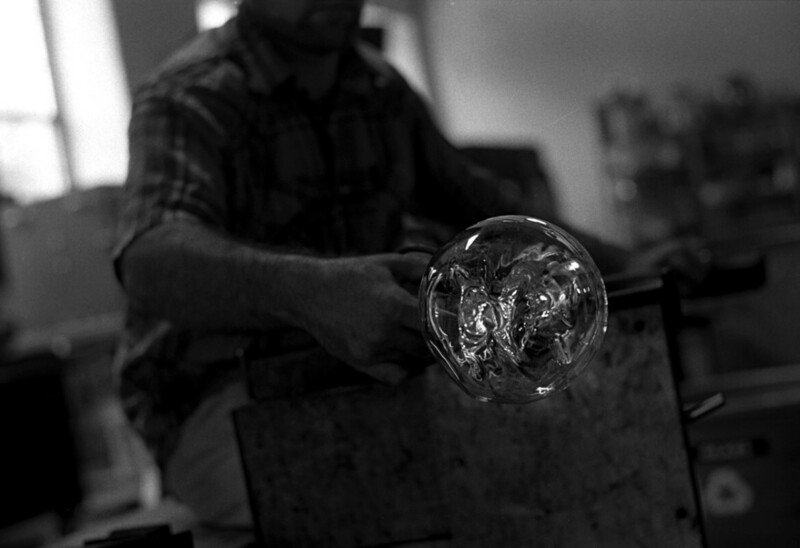 Fellow Australian John Hallett, who has a diverse background in industrial design and mold-making for glassblowing approached the ITE experience as a chance to stretch his skills as a turner, and in that he probably took the most traditional approach. 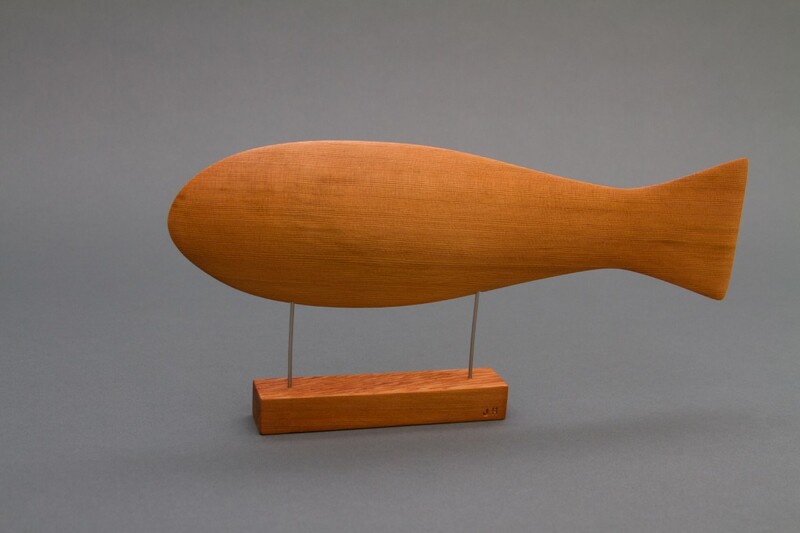 Preferring the word “craftsman” to all other designations, Hallett experimented with the lathe and the special challenge of turning extremely thin pieces of wood. The resulting objects, which aren’t practical the way a chair leg or candlestick might be, have a power and energy all their own. 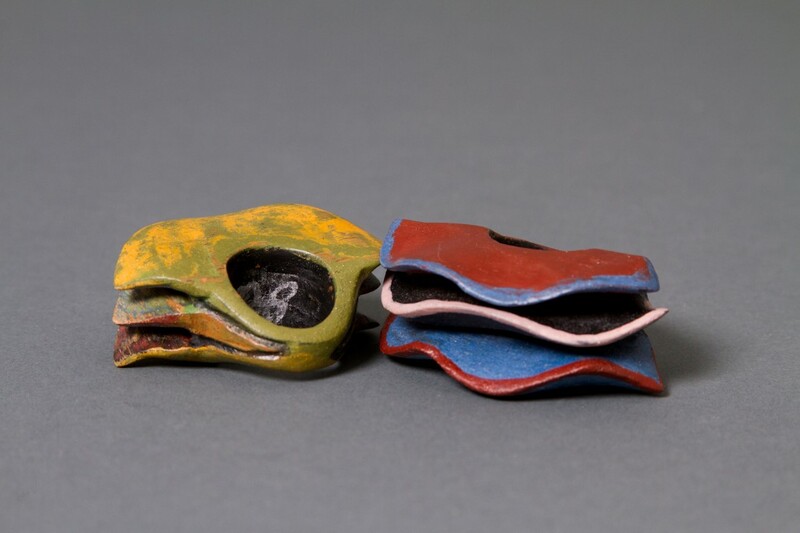 As standalone objects they might be works of sculpture, but their crafting is foremost in Hallett’s mind. 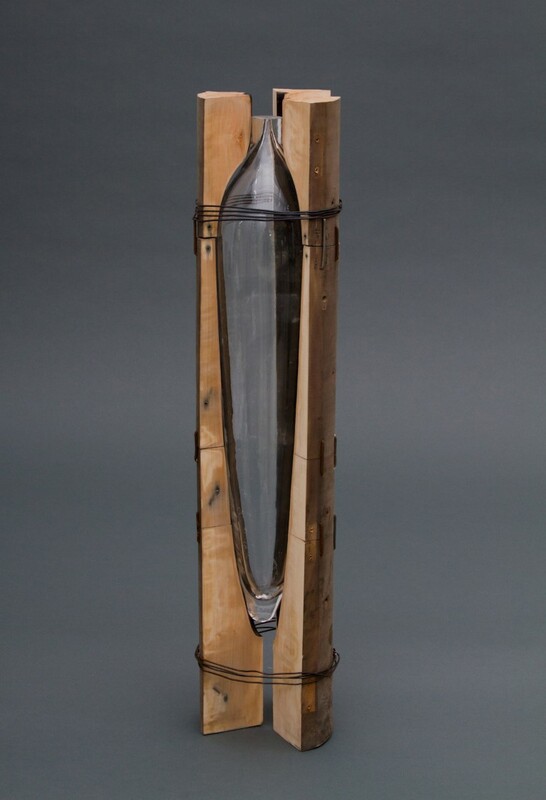 In addition to the extreme turning experiment, Hallett collaborated with fellow Resident Daniel Ostrov to create molds from pear wood for glassblowing. As objects, they are stunningly beautiful. 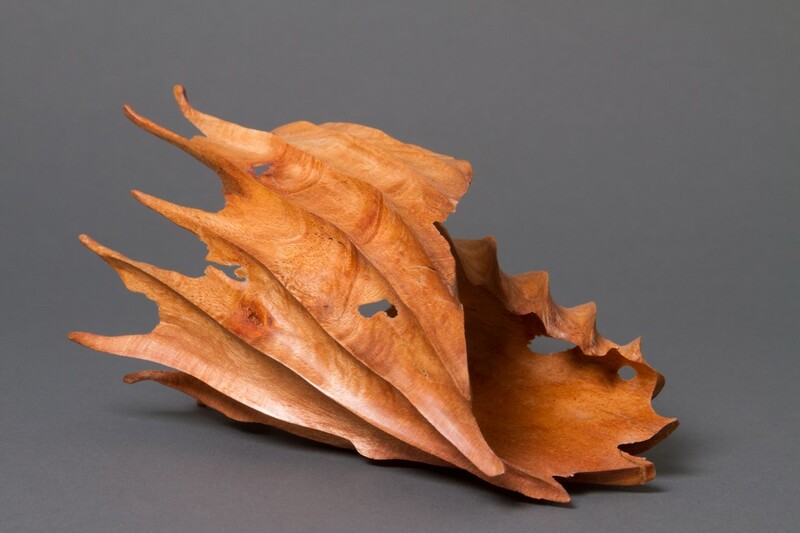 I was intrigued to learn that the creation of wood molds for glass is a small art form in itself: the wood must be kept wet, and the interior surface becomes soft and slightly fuzzy, lending an unparalleled smoothness to the wood that is ideal as a surface against which to form glass. 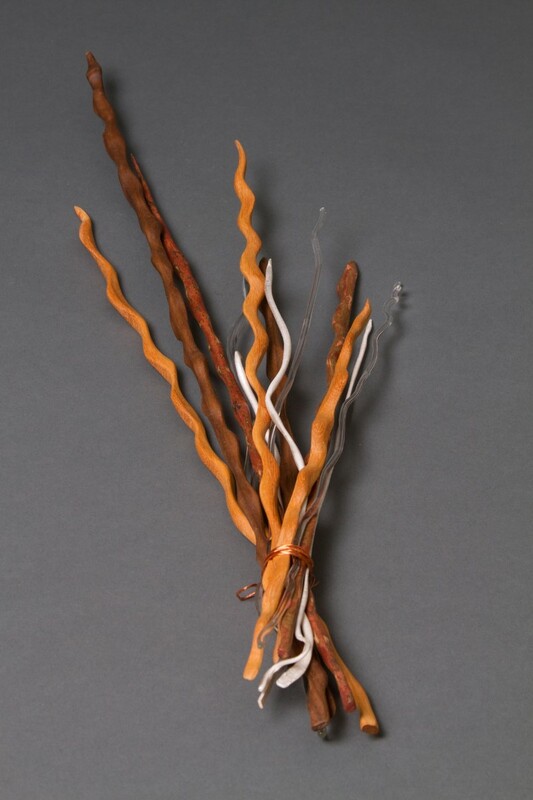 Ostrov holds an MFA in glass from Tyler, and came to the practice of woodwork from an interest in sculpture. 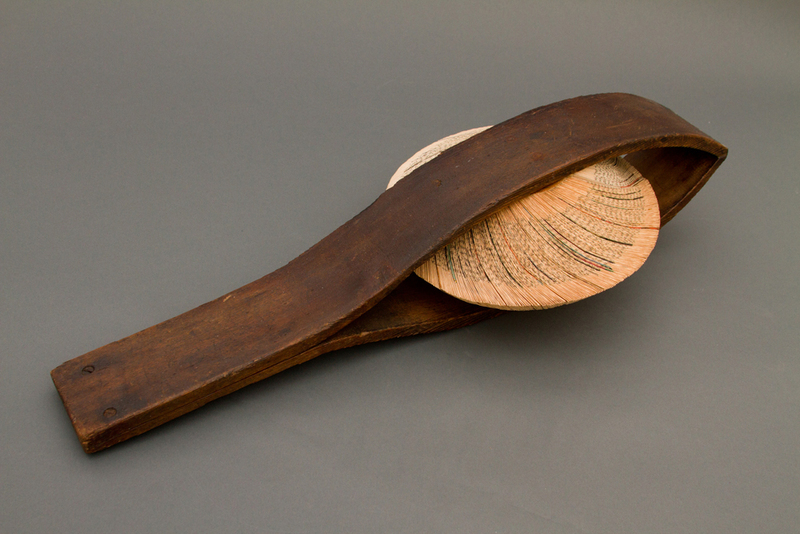 As a child, his fascination with boats led to a lifelong love of nautical design, and this point of view is evident in the extraordinary forms he created using steam bending and ash wood. Like Hallett, Ostrov used the ITE experience to experiment and take risks with a particular technique. Neither had the goal of coming out the other side with a perfected object, rather they wished to discover something about the way a special technique could lend their practice a new direction. 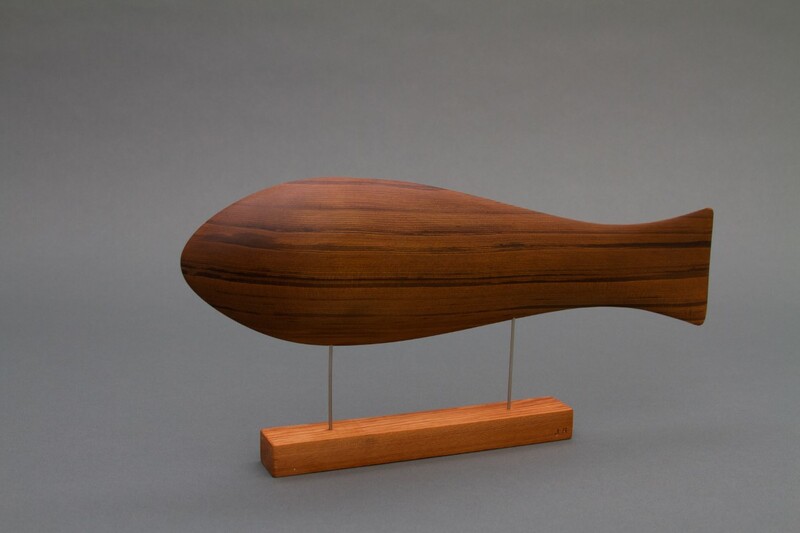 Ostrov created a series of forms made from strips of wood bent to the shape of an arc or oval, yielding works that resemble an architect’s maquettes for the design of an airport terminal. 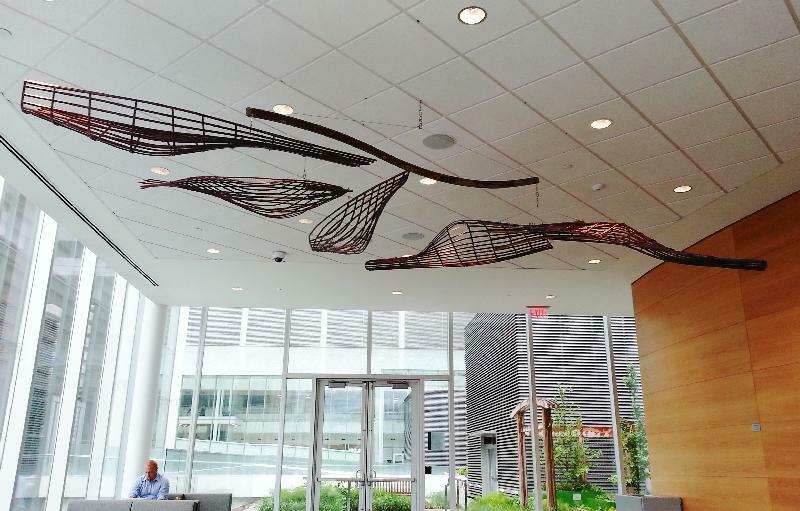 With an interest in public art, it is clear that Ostrov is thinking big in his design process. 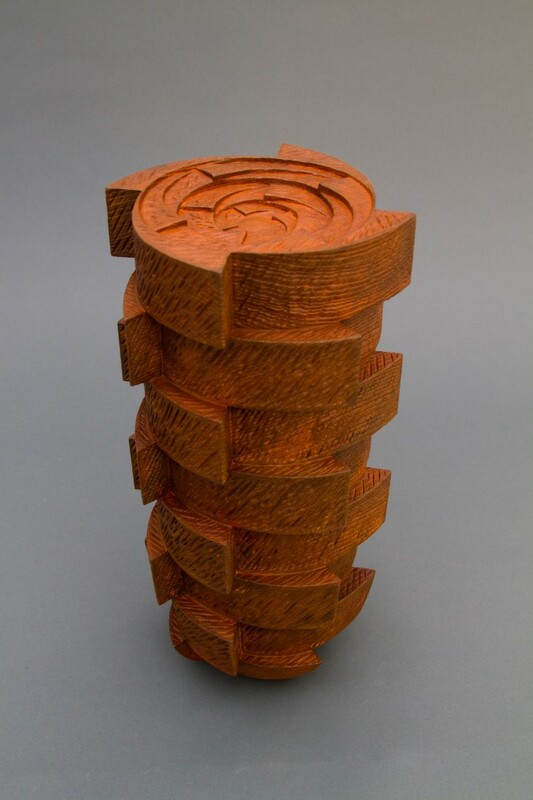 What the end result will be is not clear, but his ability to work on a human scale with wood is part of a process that will lead to an ambitious and impressively scaled project that I look forward to seeing somewhere in Philadelphia. Human scale suits Darrell Copeland well. 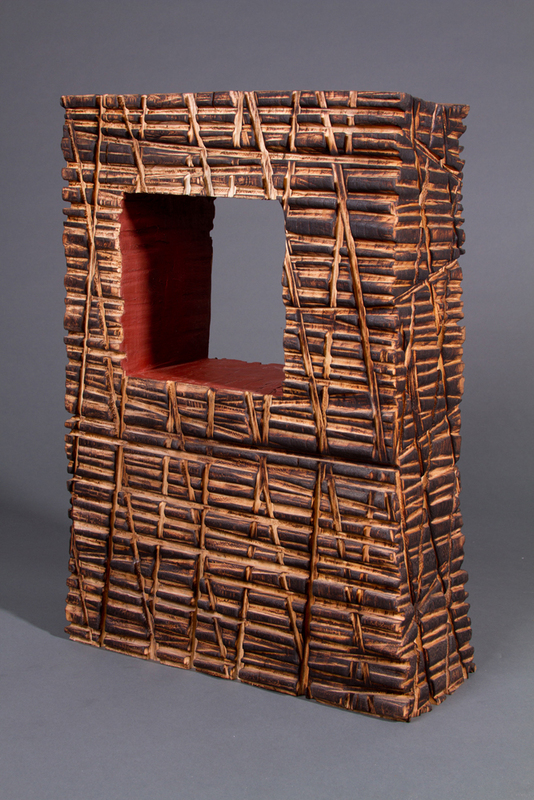 Copeland approaches the form and finish of his work with extraordinary attention to detail and incredible patience. He has developed a visual language of his own, giving the surface of his wall pieces a consistent, animated carved pattern that resembles the look of cells under a microscope. 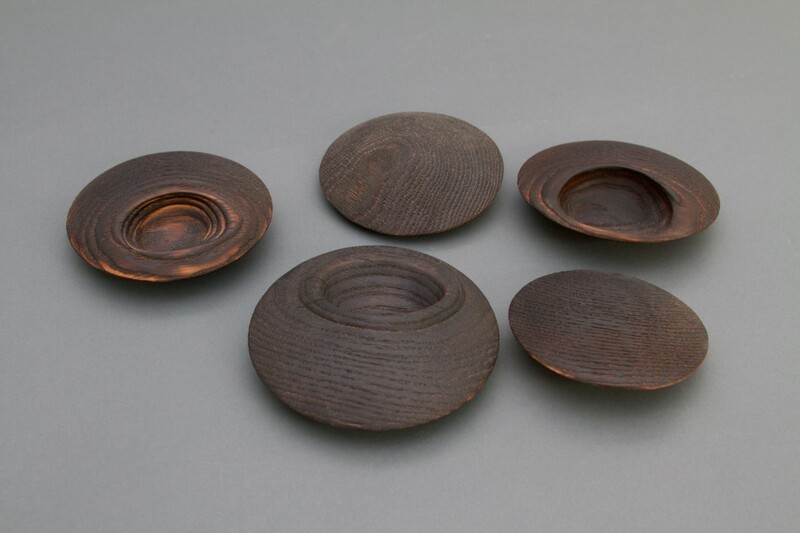 He almost never leaves wood unfinished: milk paint and open flame give his pieces a distinct palette of saturated blues or a charred surface. 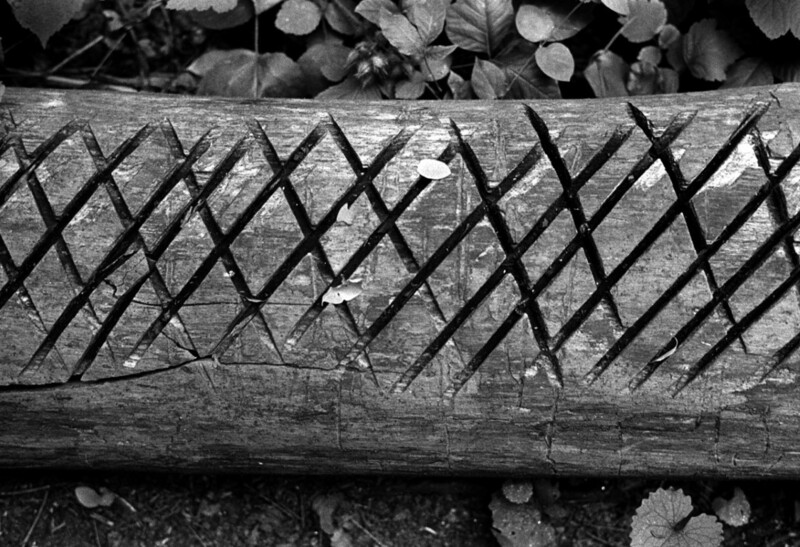 Clearly longing for the quiet of North Carolina, he responded to the cacophony of Philadelphia by carving a hopeful window through a thick block of wood, covering the entire surface with an aggressive pattern of carved channels set at angles with one another. 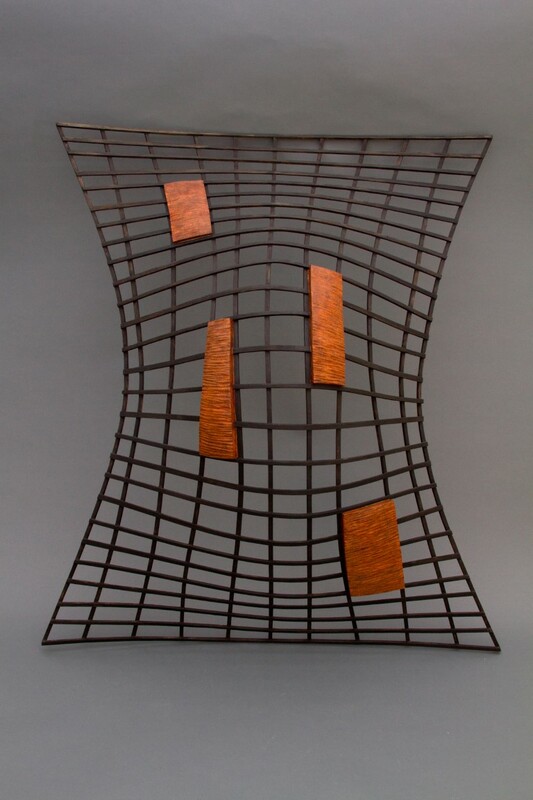 Another piece, produced in collaboration with Ostrov, alludes to the loss of his father by rendering the wood frame in an iron finish, suggesting the form of a gate or door which is bowed in three dimensions on one of Ostrov’s steam-bent creations. 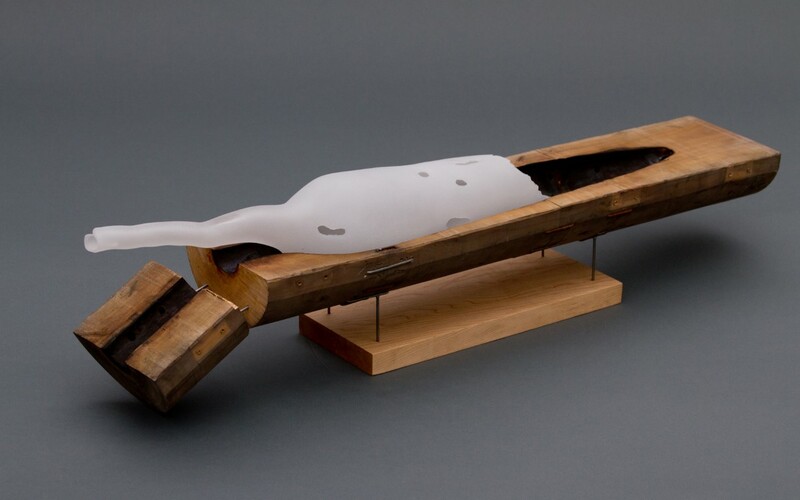 I was especially moved by this collaboration because it so clearly combined Ostrov’s interest in the power of nautical design to harness a basic force – the wind – with a personal memory of Copeland’s, associating a blowing wind with the change and painful adjustment to a new reality when a loved one is gone. 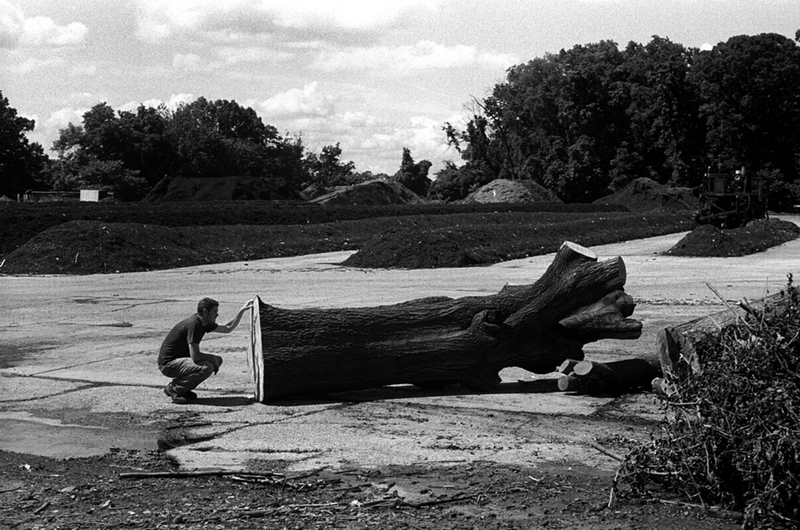 Capturing all of this was Michael Koehler, who made the crucial observation at the beginning of the Residency that film, like wood, is a material with a grain. This connection stuck with me as I watched sawdust pile up on the floor solid forms take shape, noting that Koehler was using film, not a digital camera, to record the goings on. 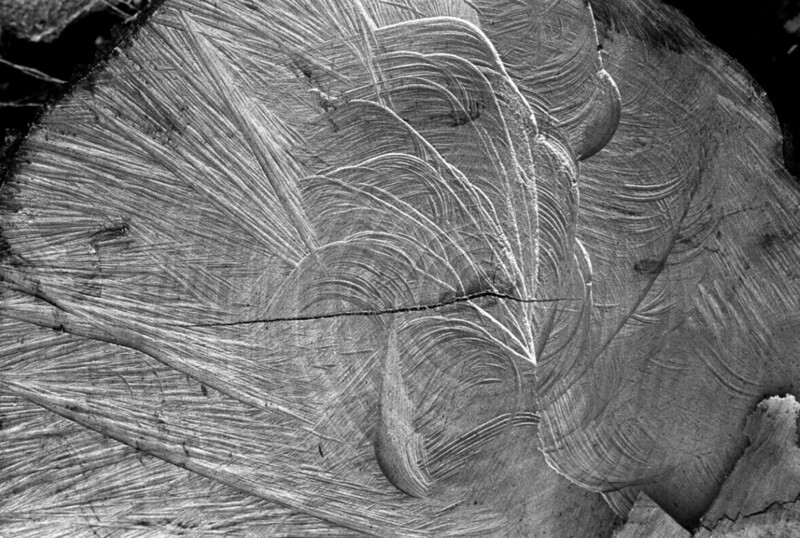 The light-sensitive surface of film is comprised of silver molecules, and although digital image-making is extraordinary today, it has yet to rival the precise ability of silver to capture detail. 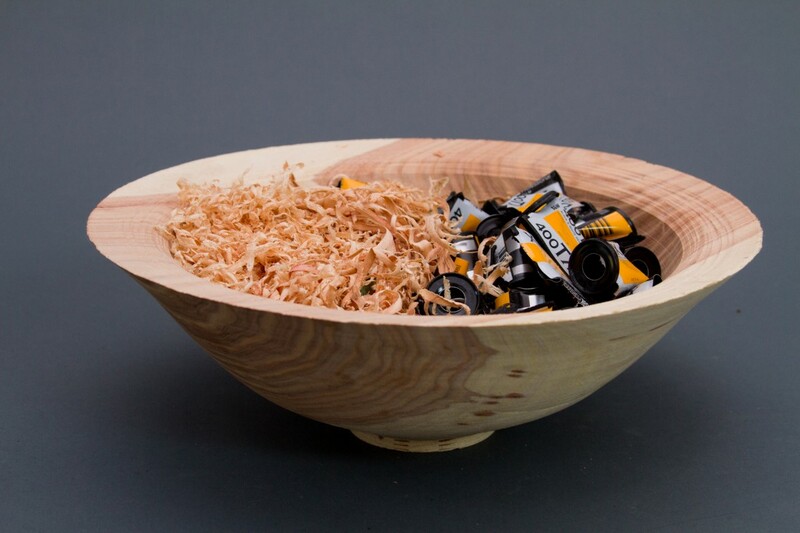 Putting his woodworking skills to the test, Koehler created a large pin-hold camera using nothing but plywood, the bottom of a soda can, blackout tape and a stump of wood to sit on. 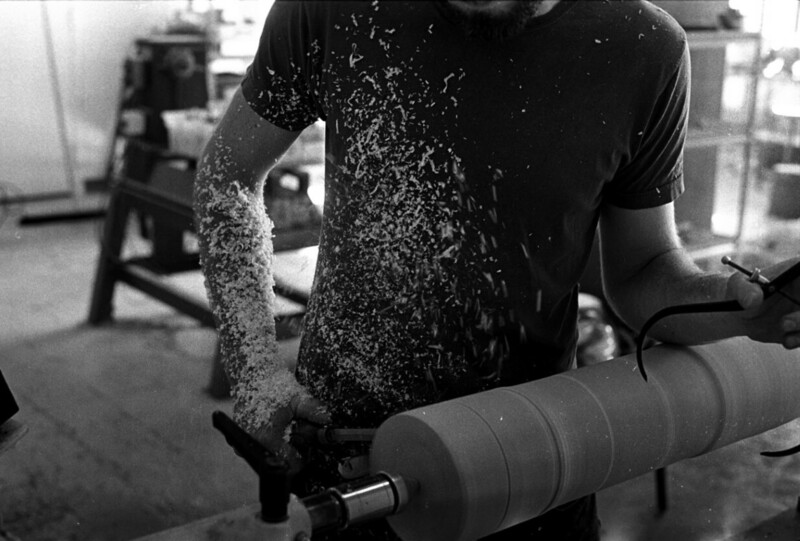 His final series of photographs – one of which is framed by a piece of wood he salvaged himself from Echo Lake, documents the Residents sourcing wood, getting acquainted with the tools and the studio, and creating works. Sixteen black and white prints form the final series, and their atmospheric graininess captures so well the material at hand, each Resident exploring its layers and possibilities in a distinct and exciting way. When I first heard of the Center and its residency program I set a goal to become an ITE fellow. True to all I had heard, this has been an incredible experience. It provided freedom to explore new methods for making my art in the company of diverse and talented artist. I enjoyed observing how each artist conceptualized and went about their work. Daniel and I collaborated on several pieces making this the first collaborative work I have done. We were graciously invited to see not only the art of collectors, but how they integrated the work into their homes. We toured museums, galleries, the studios of local artist. And, yes, we spent hours and days in studio. As I complete this residency I realize it will take time to process all that I have seen, heard, and felt throughout my time here. I leave with anticipation for this experience to resonate in future work. I thank Albert, Tina, and all who support the program. My personal journey through the ITE began with a willingness to leave my wife and the comfort of the Blue Ridge Mountains for eight weeks. I put aside my current work to experiment with different materials, tools, and techniques for texturing and painting. I literally spent weeks torturing this one section of tree with every texturing tool I could put my hands on and a multitude of paint samples. (Research can be so cruel) Gradually texture and paint explorations led me to complete several pieces for the exhibition. 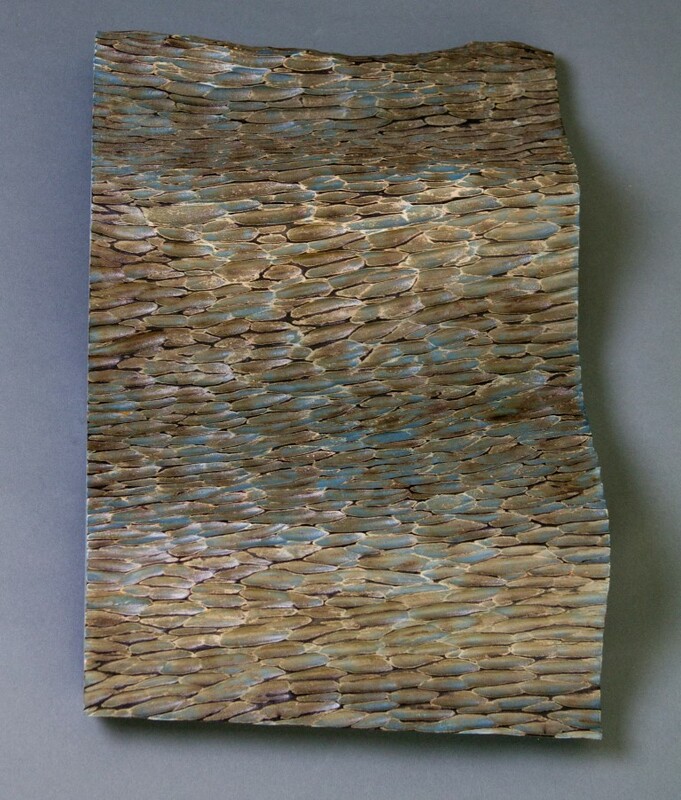 The Wave Series allowed me to create pieces with lift away from the wall, varied texture patterns, and paint effects. 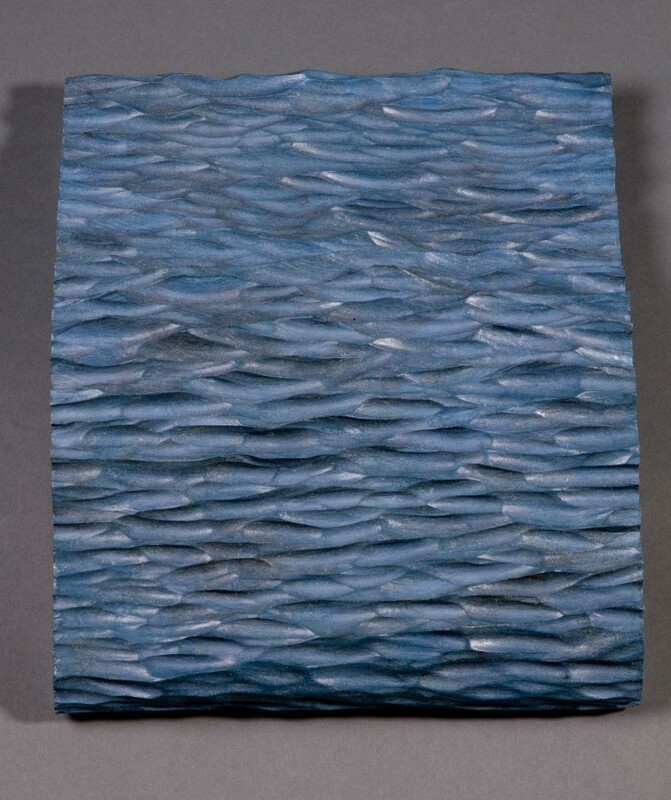 For example, you will see subtle texture and translucent blues in Sea Side contrasted by stronger texture and darkness in Stormy Weather. My discs were born when I discovered how red oak reacted to fire. I chose a soft form, mother/child like, to contrast with the scorched strong texture that I achieved by burning out the soft grain. They are very tactile, begging to be held. When We Are Dust is one of the four pre ITE pieces in the exhibition. I have just completed this piece after starting it last year while watching my father’s health decline. He recently passed and this piece is inspired by him. 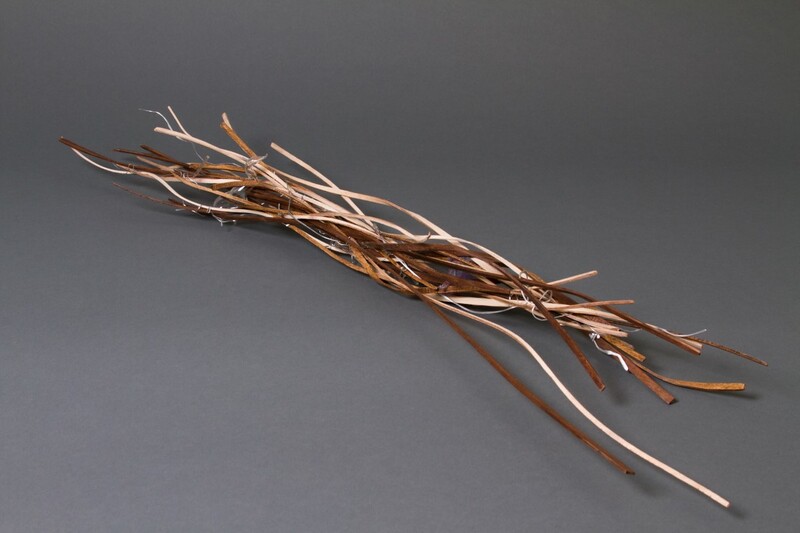 The piece is strong in form, but the rust speaks of fragility. Letting Go is a follow up to When We Are Dust and collaboration with Daniel Ostrov. While thinking about the possibility of pushing my work further away from the wall I observed some of the beautiful forms that Daniel was creating. I felt that with his form I could give my rusted pieces flight. Interestingly, there is a part of me that looks at the grid as a net holding on to the forms. Hello! 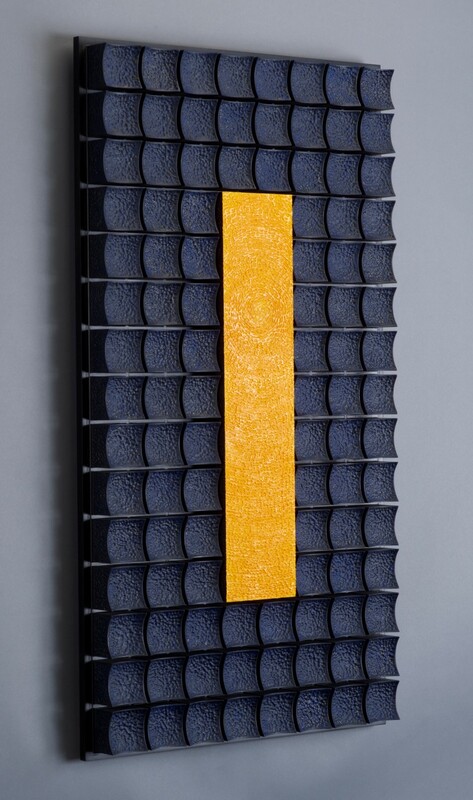 is a playful collaboration between Daniel and me, motivated by the thought of pushing a wall piece out into the room. It’s loud, it’s proud and we think the piece speaks for itself. Refuge came to me as I neared the end of the program. Central Philadelphia’s energy is such a contrast to the mountains and the life that for thirteen years I have lived. I found sound amplified, crowds and traffic magnified and buildings over scaled. By the sixth week I fantasized having a quite place to escape. With chain saw, chisel, fire, and red paint I created my interpretation of an oasis in the middle of chaos. Rocking the Blues, pre ITE, is a fun piece with a play on negative space and orientation of weight. The tilt gives it a look of motion. And it will actually rock. 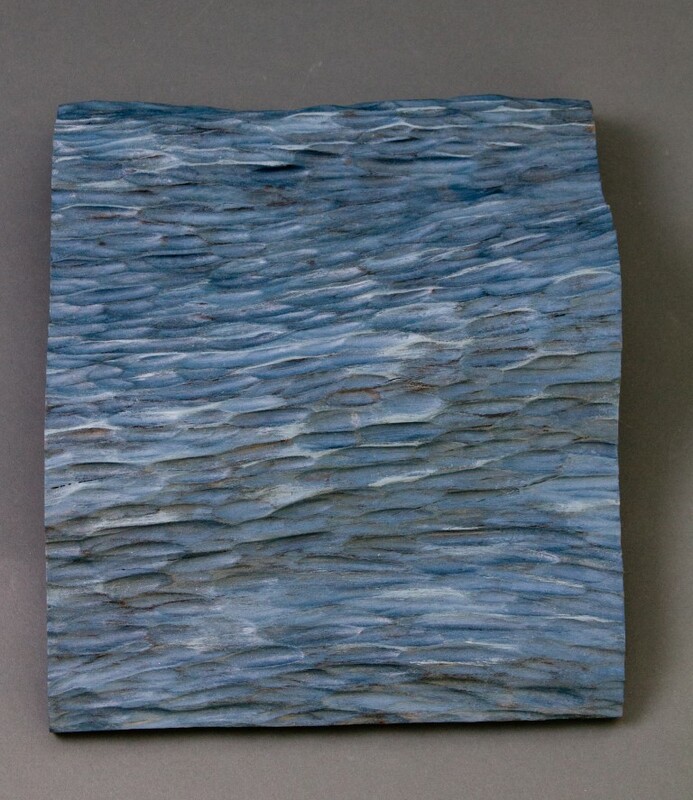 Harvest Moon II, pre ITE, is a composition of wood blocks, turned, carved with random texture, and applied layers of acrylic. With a combination of texture, form, and color I have played with the light and depth of field to establish a rhythmic pattern for visual energy. 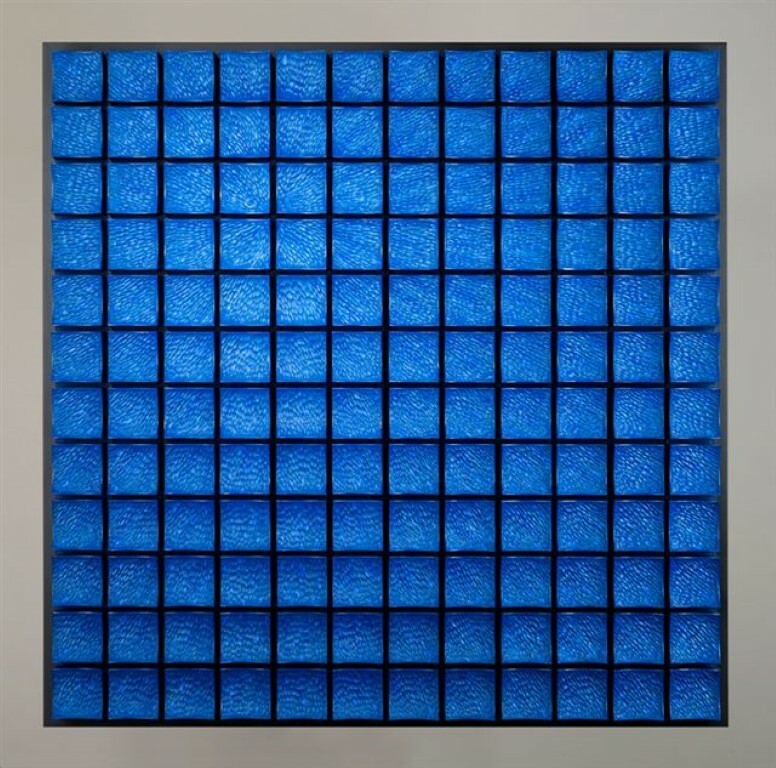 Enlightened, pre ITE, is a large wall hanging piece consisting of 140 concaved blocks that have been turned, textured in a radiating pattern, and painted in shades of blue. 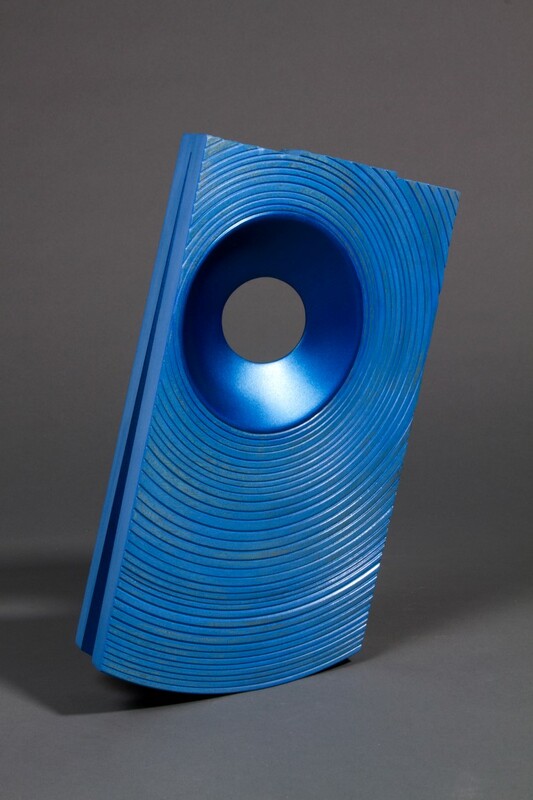 This piece comes alive with light and its blue color reflectance shifts with the slightest change in point of view. My participation in the 2012 ITE has been a most rewarding experience because it has allowed me to learn and explore woodcraft and place all that I have seen and learned in a historical the technical context. 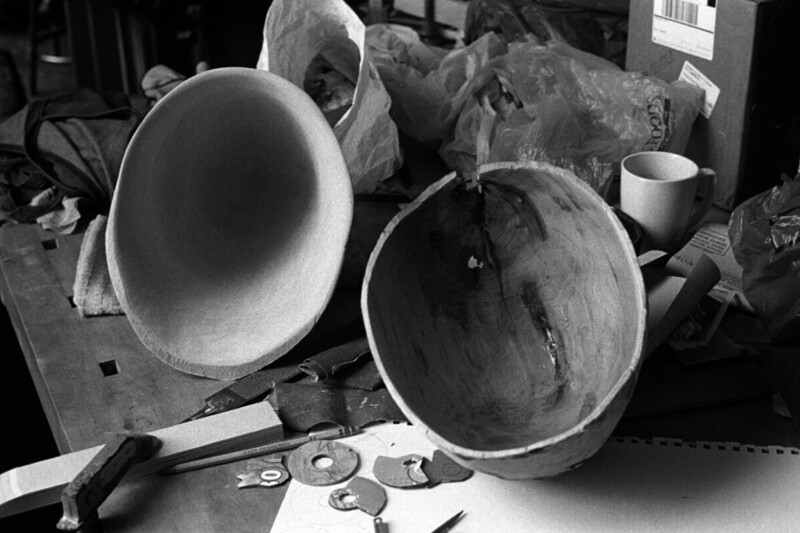 In my normal studio surroundings and craft community I am isolated as a contemporary wood turner. The ITE has exposed me to the skills, aesthetics and concepts of some incredibly talented individuals; fellow ITE residents, participating members of the Echo Lake Conference and of course, the work of other artists viewed in the collections that we have had the privilege of visiting. The ITE has given me the opportunity to work for two months, solely on artistic work, free from the stresses, compromises and the financial and time constraints inherent in running a studio-based business. I have had time to experiment and push my own boundaries significantly, allowing me to grow as a turner. 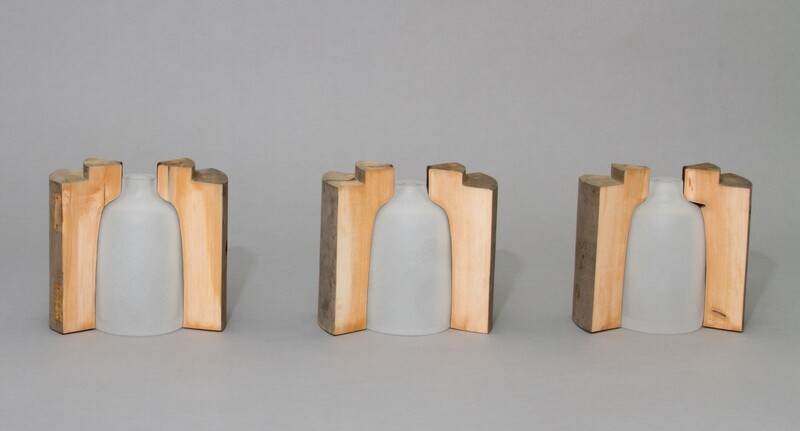 My work has a focus on honesty to materials and exploration of technique expressed in a simple, clean form. Through experimentation, the work produced during this ITE both conforms with and deviates from this as I have pushed my own boundaries. The addition of turned texture (using the skew) and surface finish (painting and bleaching) in my work has been a significant step away from the minimalist solid forms I usually create. This decoration has allowed me to add visual interest as well as showcase technique and materials. 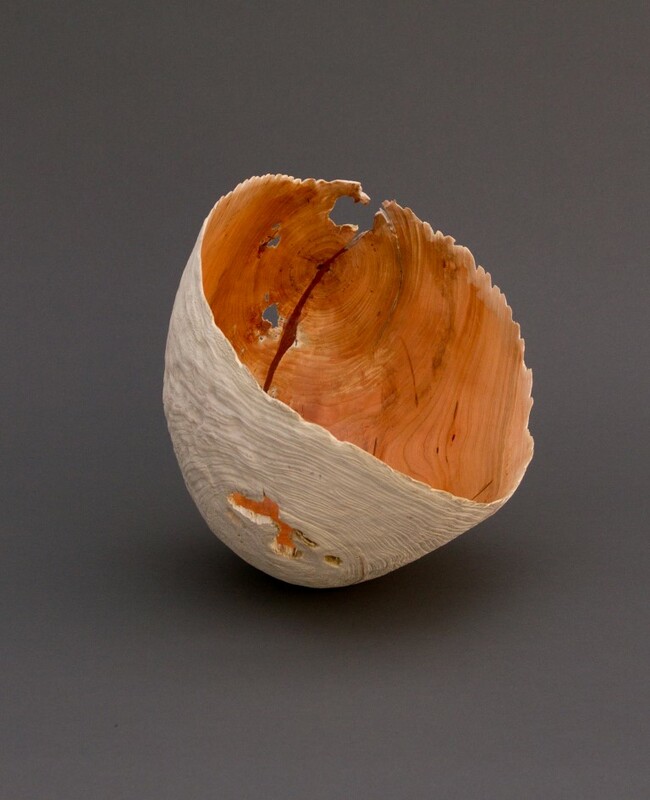 Having now been exposed to the world of woodturning and wood art, outside of South Australia, I am better able to place myself in this world. I am beginning to understand the historical context in which the field has evolved and how my work can be positioned within that context. My interest started with the material and the grain. 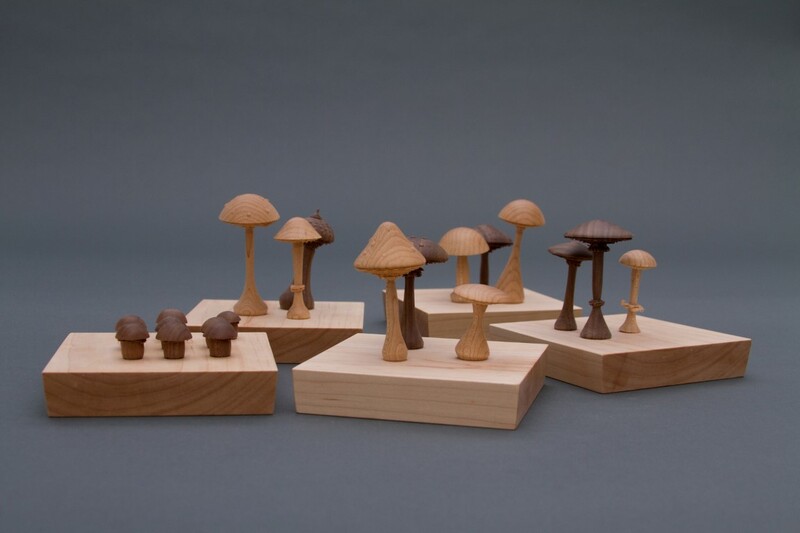 I became focused on the environment and light that created the wood, and the wood workers that would nurture the wood to its final form. The wood workers became my teachers sharing with me their relationship with wood and what goes into it to create these objects. 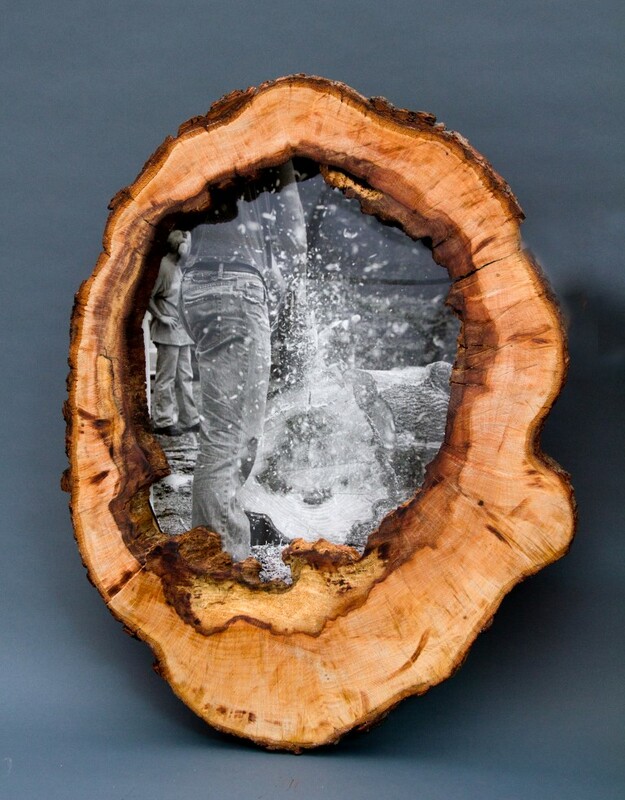 I watched as the energy was passed back and forth through the wood to the artist then from the artist into the wood. This rhythmic pattern reflected my own relationship with making pictures and the contrast between the light that creates the wood and the light the wood workers had in their studio to the dark I created in mine to develop pictures. 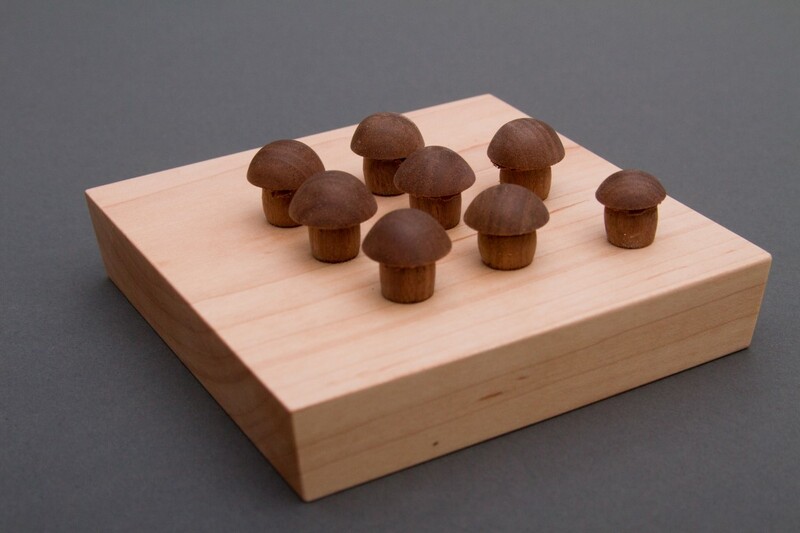 The camera uses light to create images as wood needs light to grow. I am honored to have gotten to spend time with these people and make shapes with them, working the four corners. The work that I have created during the International Turning Exchange Residency is informed by an exploration of the steam bending process. 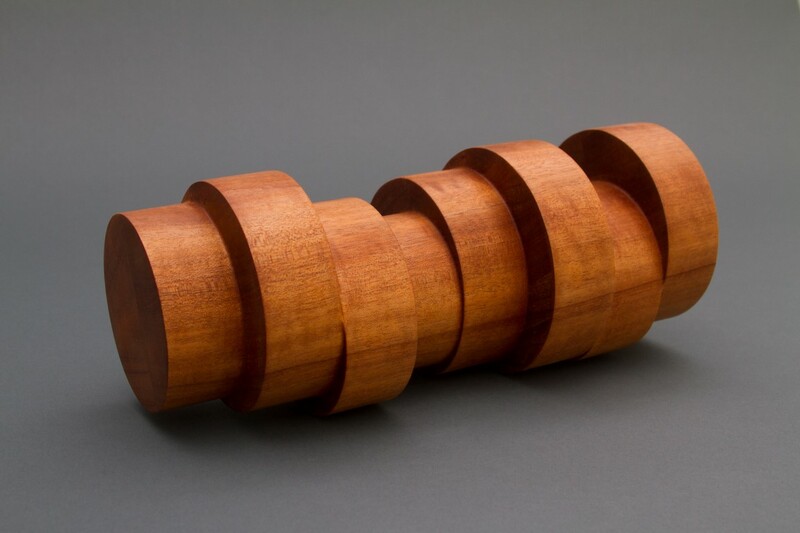 Within this process, my focus was see how simple linear shapes used as jig molds could be used to create radical forms that pushed the material of wood to its limits before breaking. I find this process intriguing because it enables me to rapidly create forms that occupy a relatively large volume of space while still retaining a sense of delicacy. Creating forms in this manner is important in the work as they become an investigation of occupied vs. unoccupied space between the viewer and the work itself. 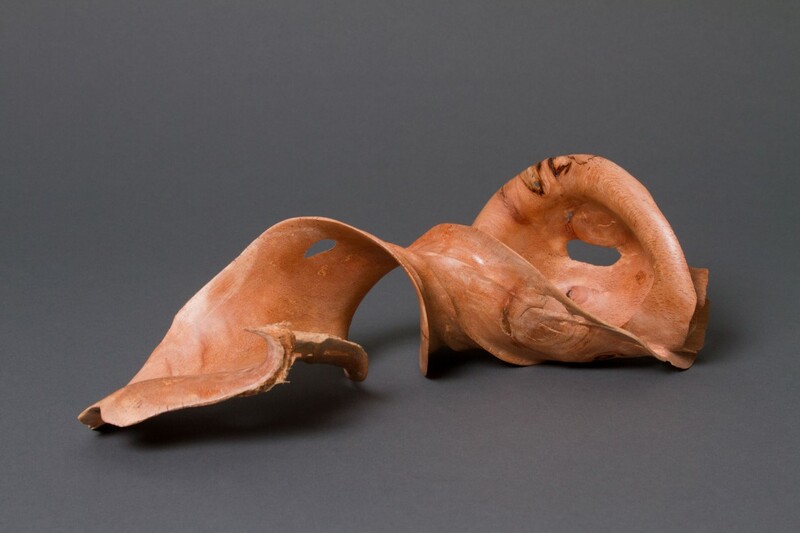 The two forms that are kinetic, Koan and her hands move like water, are designed to make the viewer aware of their own presence in relation to the work in that their movement near the piece actually affects the movement of the piece itself. This dynamic relationship is designed to express a poetry between the viewer and the work of art. 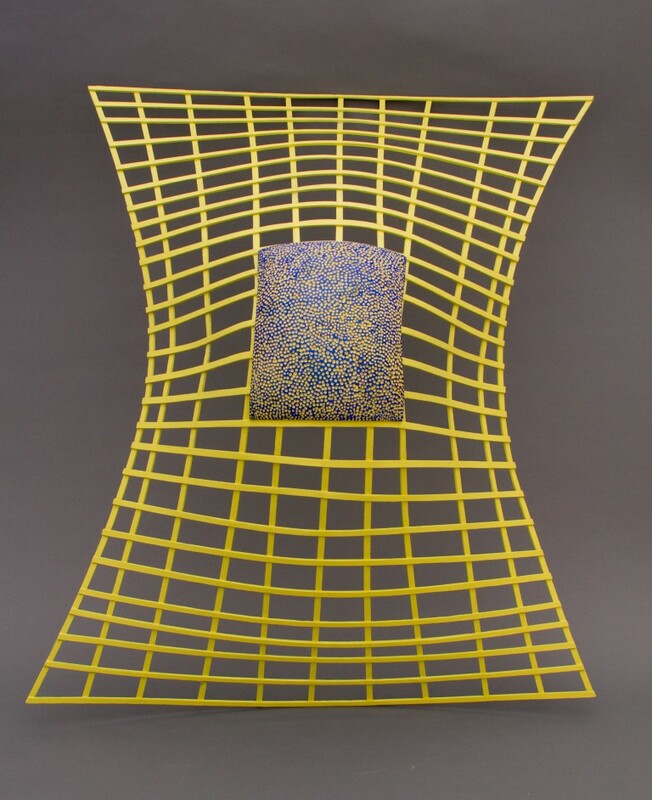 In a similar fashion, the two pieces Tree House and Cerebral Chamber, invoke the viewer’s ability to enter within the work, thus entirely changing their perspective on how they see the piece itself and their own relation to the larger space around them. While entering into these two pieces is still in a hypothetical stage, I see them both as complete works as well as early designs for larger pieces that will be physically entered into. In closing, I would like to thank Albert, Tina and the staff of the Center for Art in Wood for making the residency and exhibition possible. It has truly been a transformative experience. I would also thank my fellow residents for their openness, impute and collaboration throughout this whole experience. I believe that we have had a significant impact on each other and I look forward to seeing how our work is changed in the future. Finally, I would like to thank Stephanie Cole for her tireless help assisting me with all the various processes involved in creating these pieces. These pieces would not have been possible without you. Thank you for giving me the opportunity to live this fantastic dream! 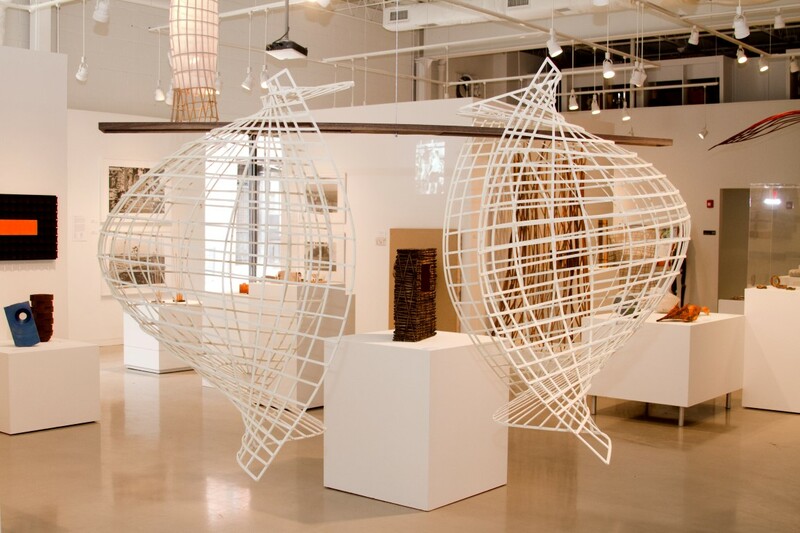 The residency program provided a wide range of opportunities to extend my work practice. The visits to artists, art collectors and museums provided an awesome insight, sometimes I was overwhelmed by the sheer diversity of these talented crafts people art work. This was added to by sharing a workshop with professional artists provided a rich and sharing experience that will have a rippled effect on all our future work practice. Many thanks to Albert LeCoff and his team at the Center of Art in Wood, your enthusiasm and thoughtful help gave us so much support. A big thank you to all the artists and art collectors, who opened their homes and gave so freely of their time, providing an invaluable experience and insight into the American art and craft market. 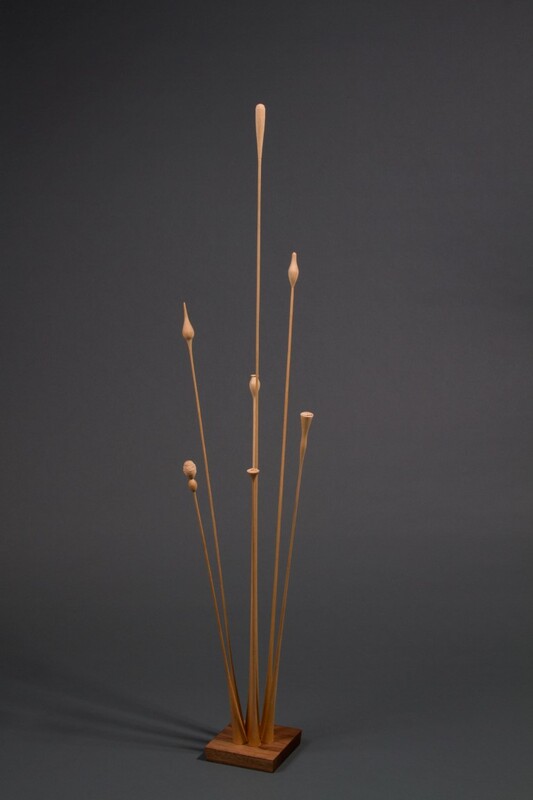 The residency was the ability to concentrate on my sculpture work without the demands of everyday life and to share that time with four other artists was to provide interesting dialogue and were inspirational in the further development of my ideas and work practices. The body of work that evolved reflects my exploration of the gardens and cityscape of Philadelphia, my trip to Boston’s arboretum and Washington’s botanical gardens. Working in North American timbers was new experience for me and by solving the challenges that evolved through my experimentation. This lead me to treating wood with bleach and milk paints, all new to me, and has now opened a new avenue of continued exploration. 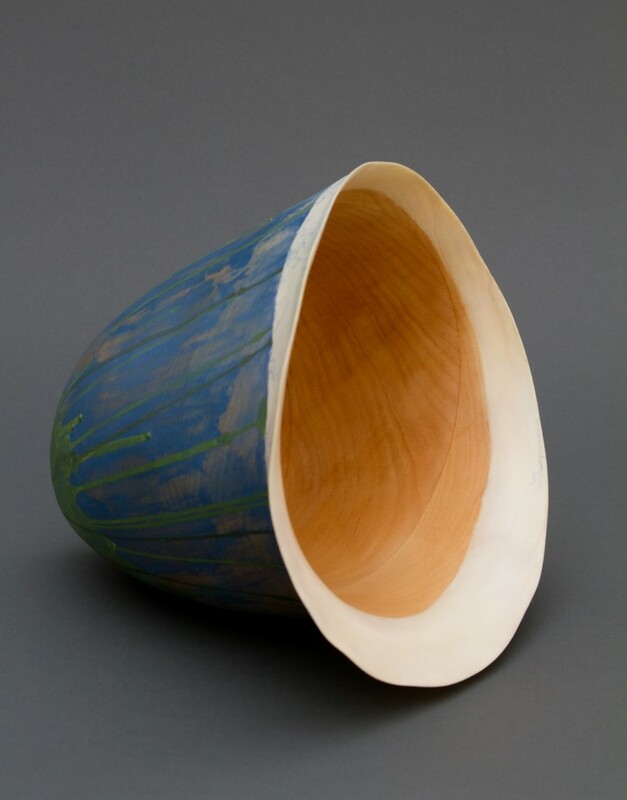 Central to my art practice is the dialogue between form and materiality – the inclusion of glass, a new medium for me, reflects and highlights certain qualities of wood. 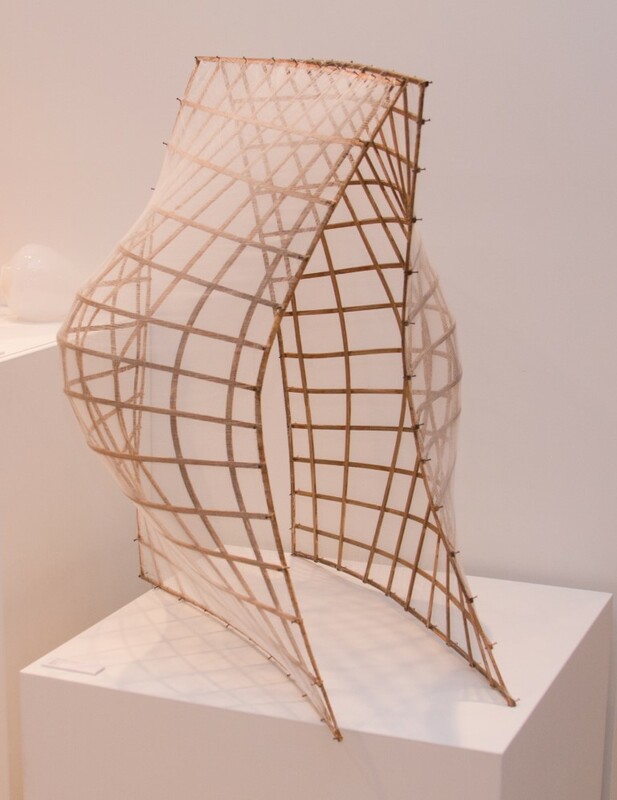 Overall this body of work I present is the influence of a shared work space, an indulgence of artistic dialogue, a reflection of a new sense of place, and a desire to create sculptures that capture all the vitality of the richness of my ITE experience. 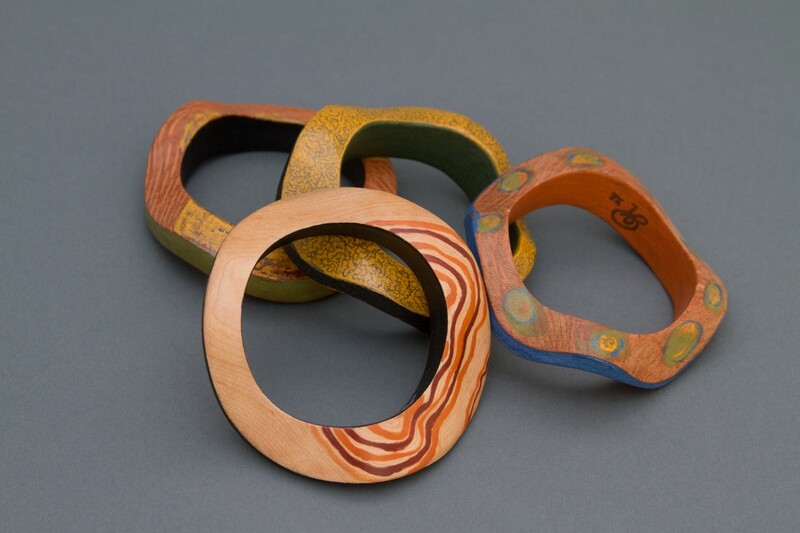 Special Thanks to: Partnership with University of the Arts (UArts) – wood shop & lodging; Shop facilitators: Tara Inman Bellofatto and Marc DiGiaimo; Regina Barthmaier, Administrative Coordinator, UArts College of Art & Design; and Fairmount Park Wood Recycling Center for materials. Sponsors: Bucks Woodturners; Philip Hauser; and Robert & Mary Lou Sutter. 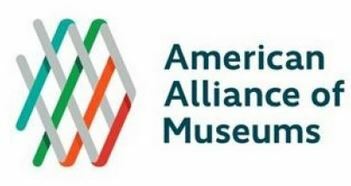 Hosts: Nicholas Bell; Renwick Gallery; Judy & Jeff Bernstein; Fleur Bresler; Charles Hummel, Winterthur Museum and Garden; Deena & Jerry Kaplan; Karen Depew & Steve Keeble; Tina & Albert LeCoff; Jane & Arthur Mason; and Mark Sfirri – home and tour of Wharton Esherick Museum. Corporate Sponsors & Foundations: William Penn Foundation; Windgate Charitable Foundation; Citizens for the Arts in PA; PA Council on the Arts; Craft Supplies USA; Penn State Industries; Rockler Woodworking and Hardware; Sign-A-Rama, Philadelphia; Government of Western Australia Department of Culture and the Arts; and Samuel S. Fels Foundation. Cambium Circle Members: Lee Bender & Carol Schilling; Edward Bresler & family; Fleur Bresler; Phyllis & Sidney Bresler & family; John Dziedzina; Richard Goldberg; Robyn & John Horn; Susan & Jeff Kahn; Bruce A. Kaiser; Karen Depew & Stephen Keeble; Sheryl & Tim Kochman; Alan LeCoff; Tina & Albert LeCoff; Ed Levy; Earl Powell; Mark Rubin; Seymour Rubin; Robert & Mary Lou Sutter; Matthew Van Dyke; and Ronald & Anita Wornick. Every attempt has been made to include all donors in this listing. We apologize for inadvertent omissions.